Today I cycled to Watson Lake to pick up some groceries. 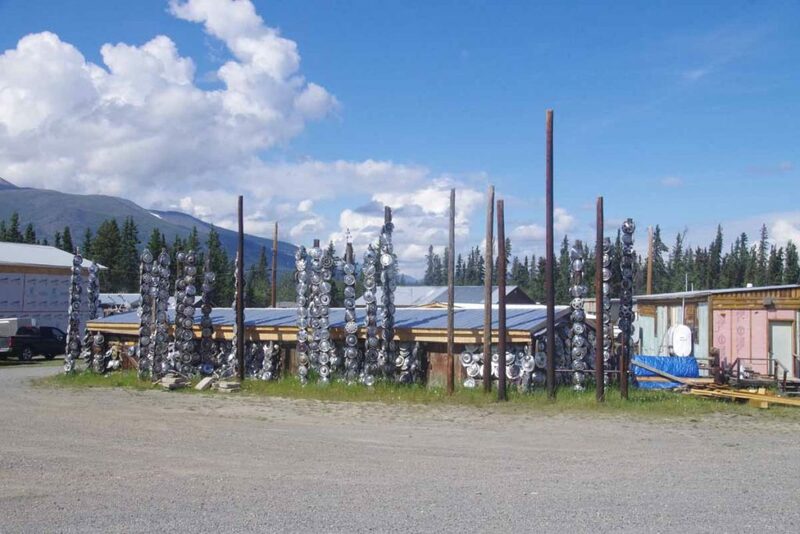 Nugget City is ~1km from intersection with Cassiar Highway but ~22km from Watson Lake. I could leave my heavy panniers behind. I was surprised at how much easier it was to pedal. This will be useful to figure out for Great Divide if there is anything else I can reduce the weight. 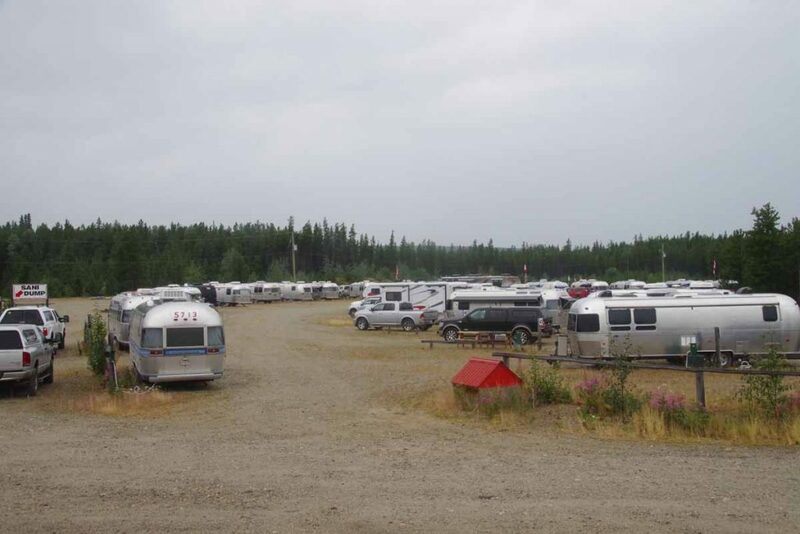 Last night there was a group of 30+ airstream trailers that also stayed here for two days. 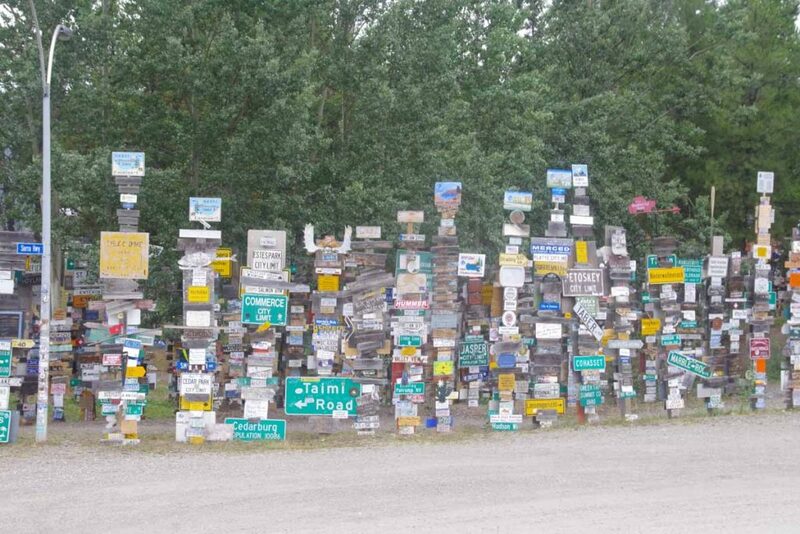 It is an organized group on a two month trip going up the Alaska Highway and back down again. It was overcast and slight drizzle as I left. One kilometer I passed the start of the Cassier shown below. 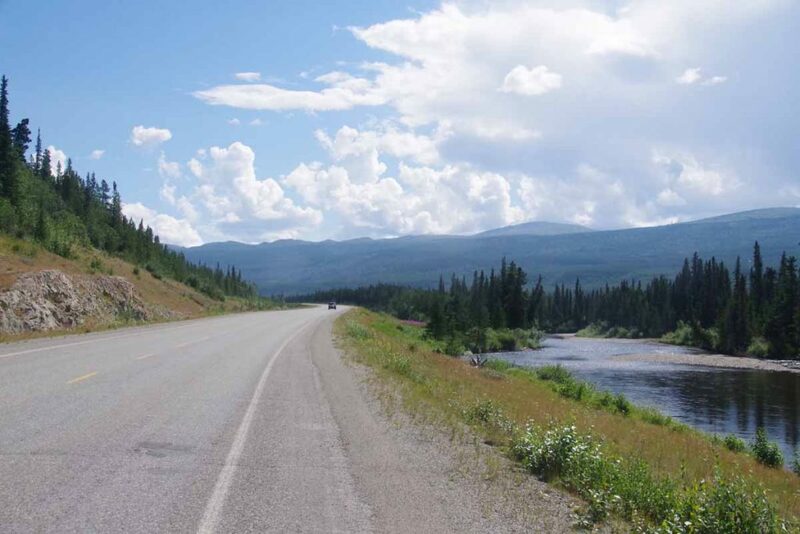 It was mostly downhill until the Liard River at 12km and then a several kilometer climb. This is particularly where I noticed the weight difference. Motivation to build the road came just after Pearl Harbor with concern that Japan could attack Alaska and establish a beachhead to attack North America. This concern was magnified in May 1942 when Aleutian Islands Attu and Kiska were taken and skirmishes made around Dutch Harbor. The route was chosen in part to link together a set of airfields along the “Northwest Staging Route”. These airfields were used to fly US-built airplanes across the Bering Strait to Russia where under “lend lease” they were painted with Russian marking and used in battle on the eastern front in Europe. It took less than ten months to build the original “mud road”. That is the amount of time between when congress authorized the work and when victory was declared. At the time congress authorized the work, they hadn’t yet gotten agreement from Canada, it was just assumed it would be given as part of the war effort. 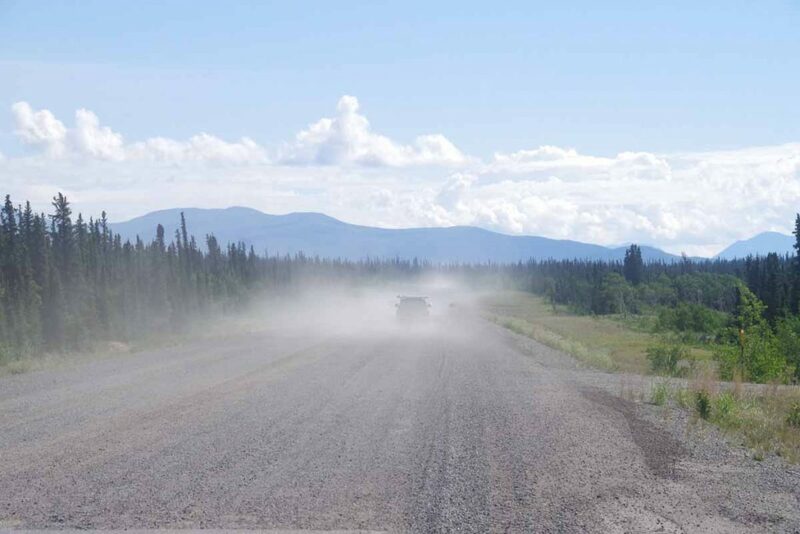 In 1943, the Public Roads Administration (PRA) was chartered to turn the mud road into an all weather gravel road. After that first winter, when it melted, many bridges watched out and road bulldozed over frozen muskeg melted becoming impassible bog. That started a gradual level of improvement of the route. 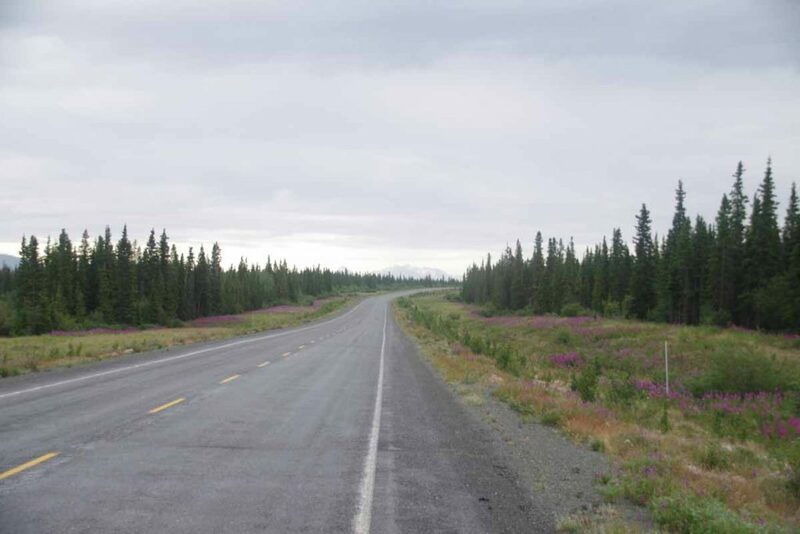 In 1946, after the war, the road was turned over to Canada. Canada made payment of approximately 1/2 of the original construction costs. Overall I found it interesting after traveling half of this road, to see how it originally came to be and was constructed 74 years ago. 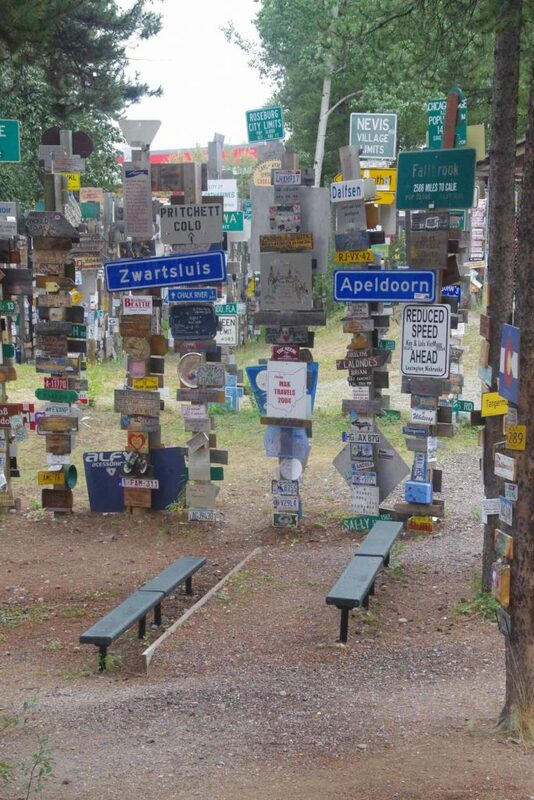 The other interesting here was the signpost forest. 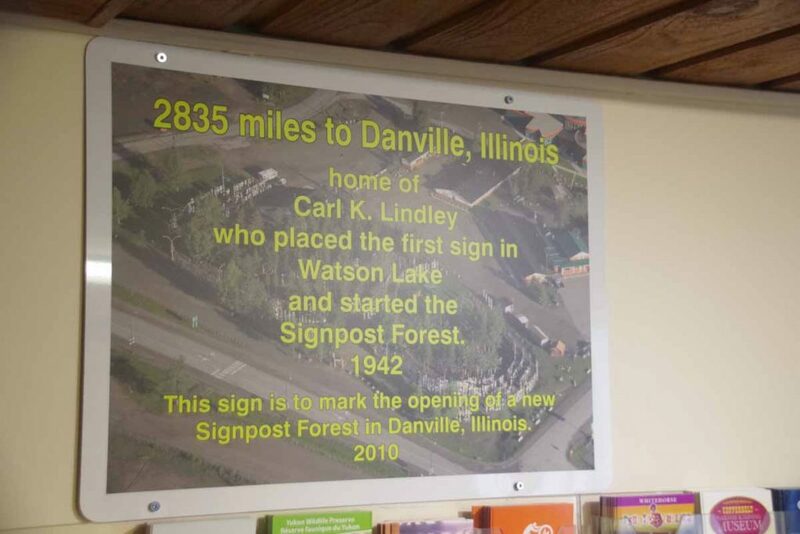 In 1942, one of these construction workers, Carl Lindley, placed a sign indicating direction and distance to his hometown of Danville, Illinois. 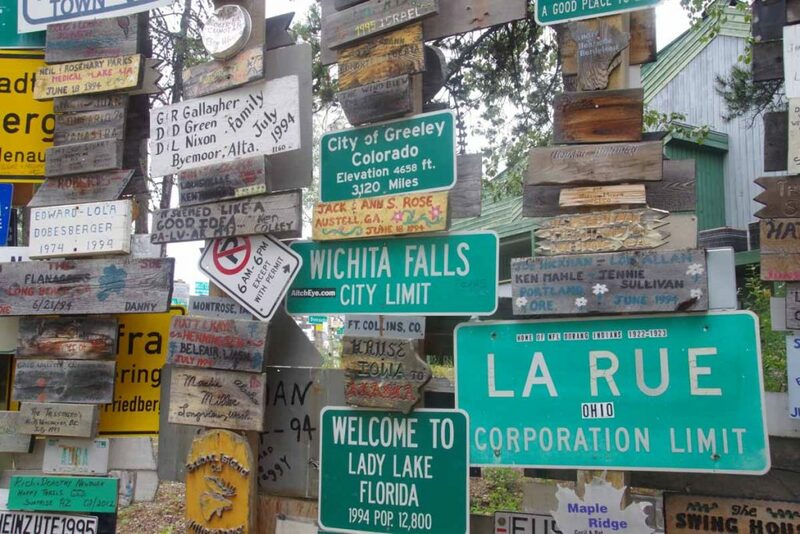 It went viral (pre-internet, viral over many years), after that with a steady progression of signs being placed. 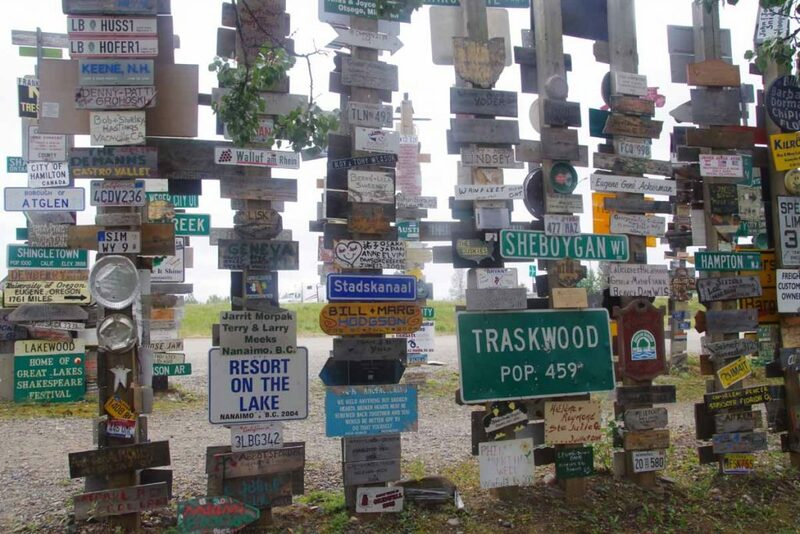 By 1988, there were over 6000 signs in the signpost forest. Now there are more than ten times as many. Below you’ll see some of the pictures I took of signs. 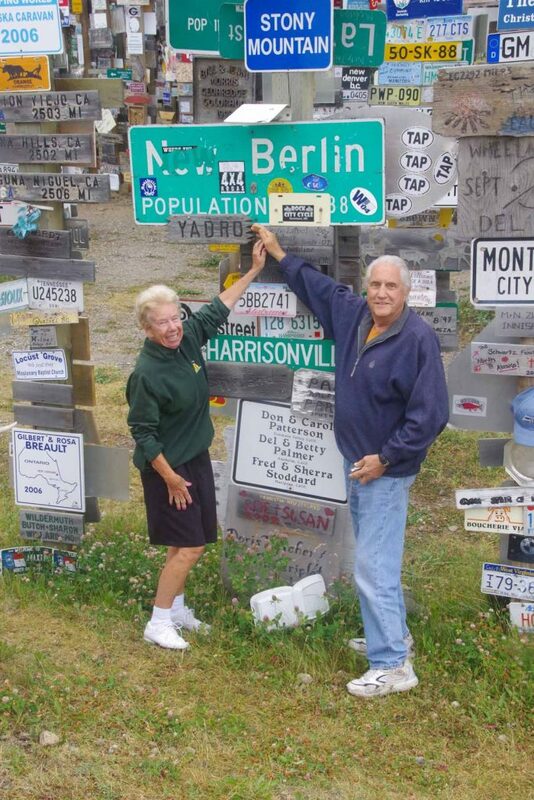 These folks were from New Berlin Wisconsin. They were happy to have found “their” sign. Dutch readers will notice a few places from the Netherlands in this one. My grandparents lived in Stadskanaal for a while. After all wandering around around the signpost forest, I stopped by post office to mail away a few items. I also found grocery story below. After that cycled to far end of town to the recommended restaurant (BJ’s) and then cycled back to Nugget City. It rained a bit more on the way back but overall a nice day trip of almost 50km round trip. 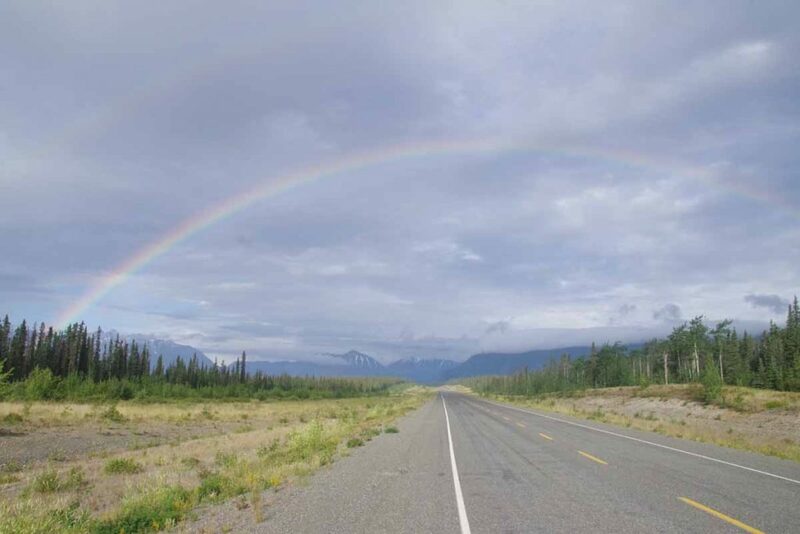 Tomorrow plan is to start down the Cassiar Highway. 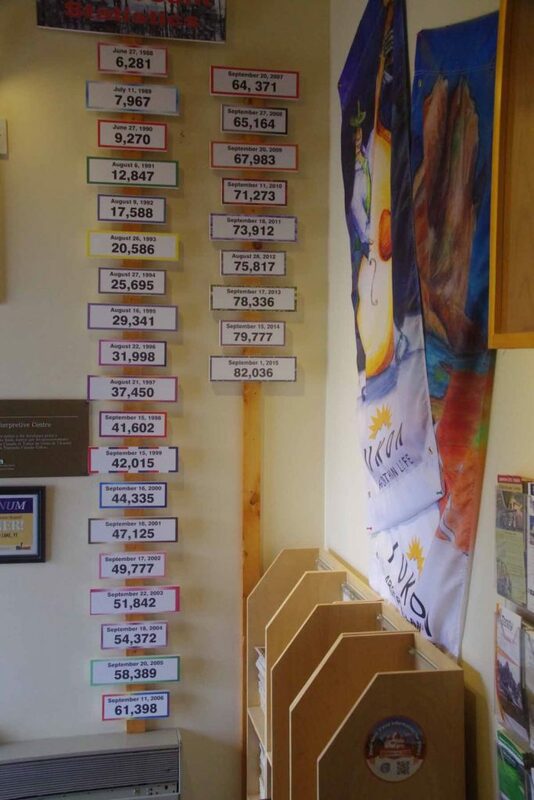 The position of services suggests likely 9 cycling days of ~80km per day to cycle the Cassiar. 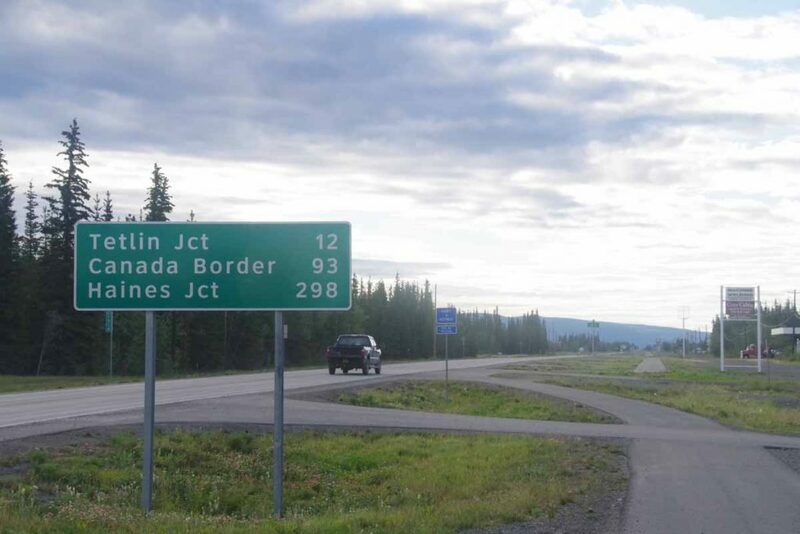 Will be interesting to compare with Alaska Highway. 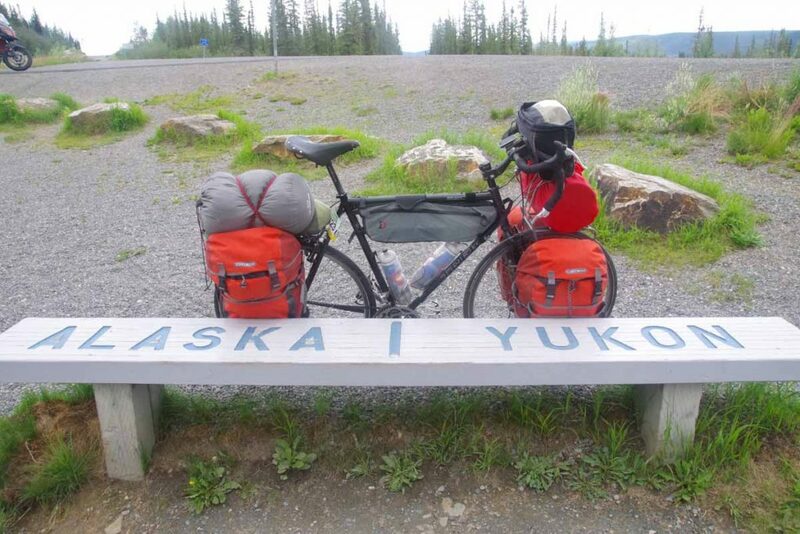 Three days of cycling, brought me from Teslin to the junction of the Cassiar and Alaska Highways. I split the 243km distance into three not extremely long days, though there were a surprising number of short steep hills to climb. First day set the theme for hill climbing. 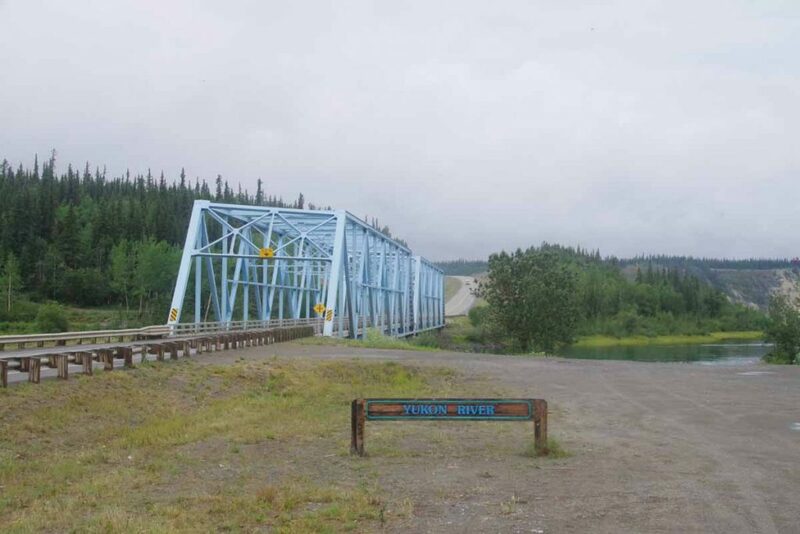 Once I crossed the Teslin Bridge shown above, there was a 3km long climb that started with 150m for the day. After that a descent, but in the first 40km to Morley River, a surprising number of little hills and drainages to cross. I had started a little past 8am, later for me but waited for lodge to open and get breakfast as well as read paper and do the sudoku puzzle. 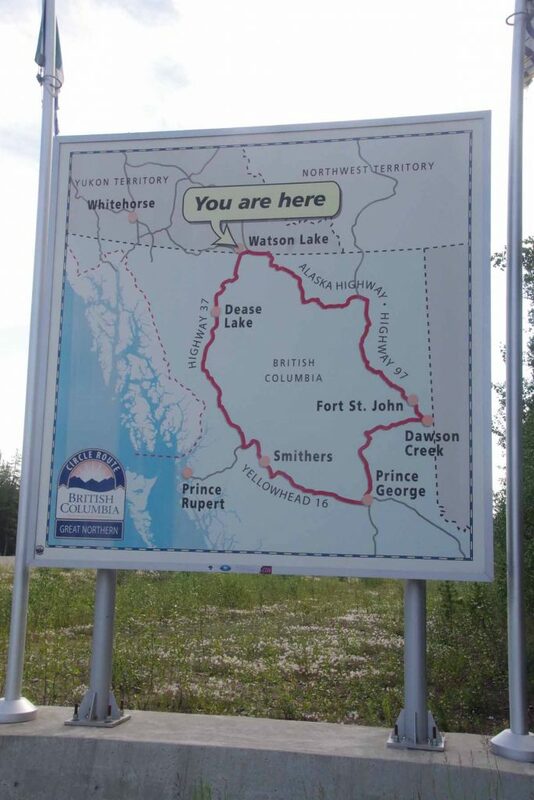 After climbing out of the Morley River drainage, around 45km brought me to the border with British Columbia. 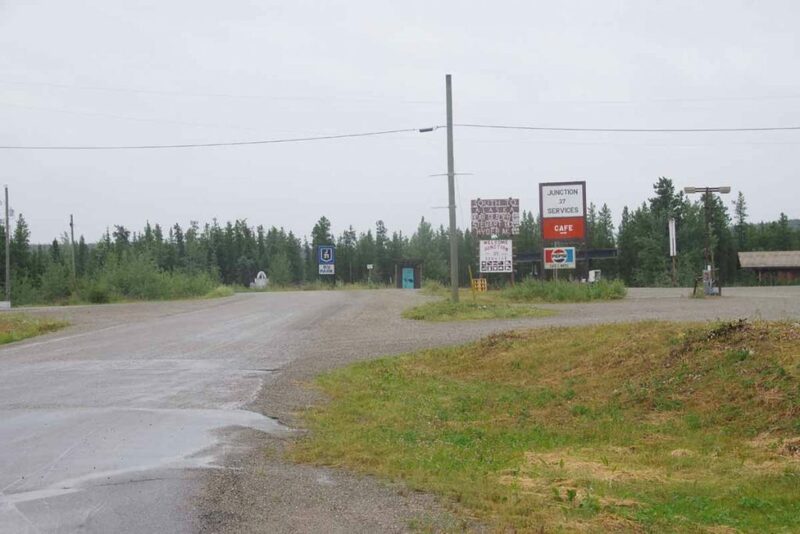 The Alaska Highway makes a total of seven crossings of the YT/BC border before finally leaving YT a bit east of Watson Lake. 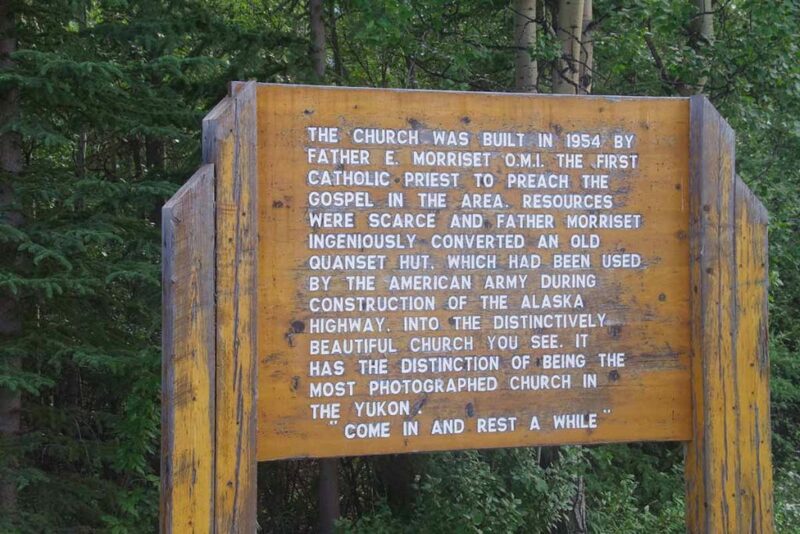 Not much past this sign was a rest area where I met a group of 22 Norwegian motorcyclists on their way up the Alaska Highway. It still surprises me how many of such groups still ride this road as a big adventure. In this next stretch I saw two cyclists heading the other way. First didn’t stop, but second let me know that my potential end-point, above, wasn’t going to be that interesting. I had picked a rest area that was also listed as access to fishing, thinking this meant one could get to water. However, as can see above the rest area was wide open and no easy access either. 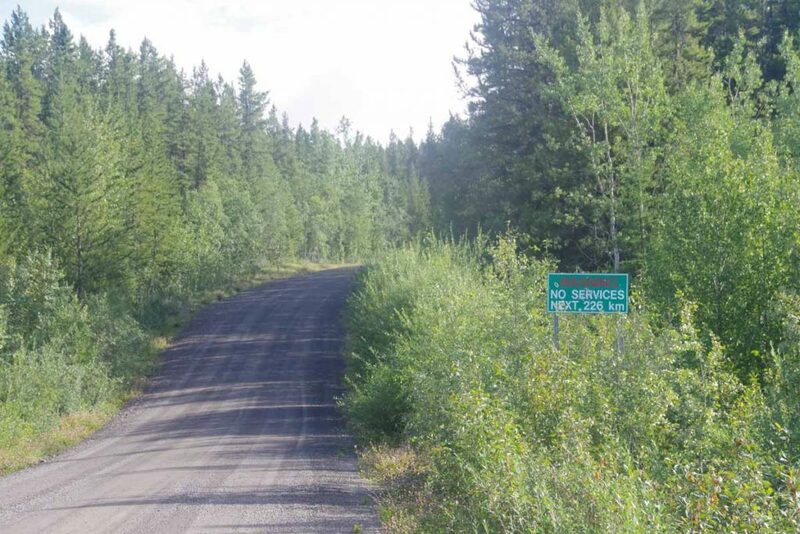 However, without much difficulty went 2km further to end at 93km and down beside the road at place known as Screw Creek. First night sleeping in BC. 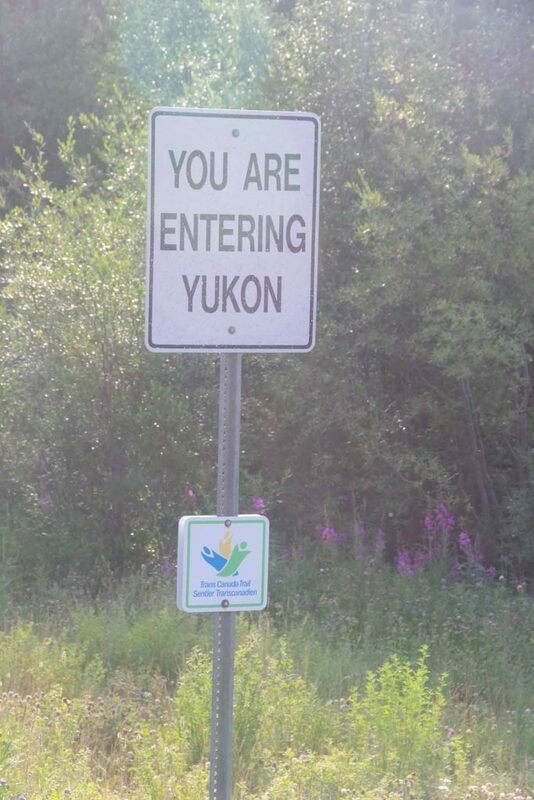 Second morning, over a few more hills and the road led back into the Yukon with a fairly simple sign shown above. 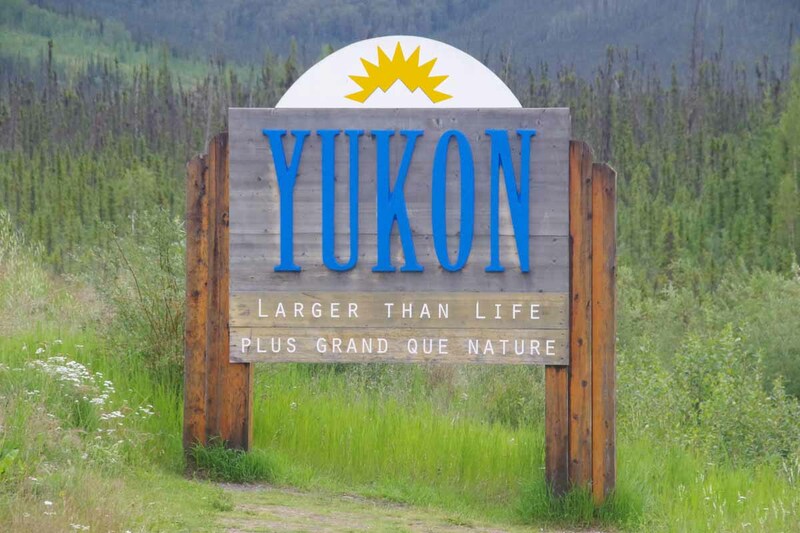 I was climbing up to a continental divide crossing – naming the dividing point between waters that drain to the Yukon and waters that drain to the McKenzie River. 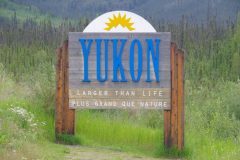 One sign suggested that presence of predicable food supply (salmon) in the Yukon led to less nomadic populations. 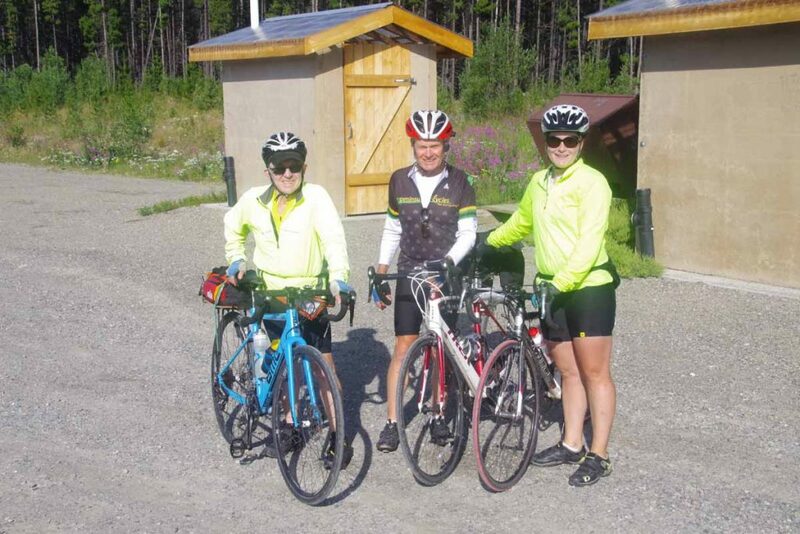 I also met these three Canadian cyclists at the continental divide crossing. 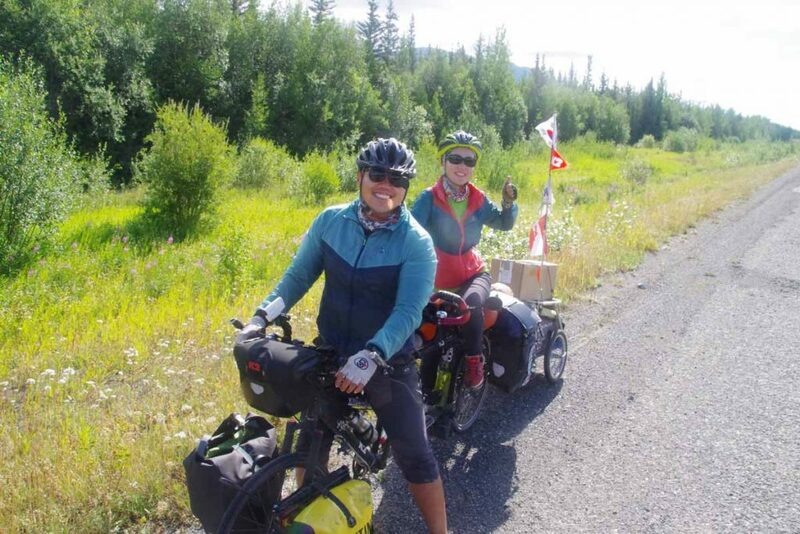 They were headed towards Inuvik and had a 170km day planned today. A pleasant surprise just two km later where there was a lodge open that I hadn’t expected. The normal cook was away and the woman behind the grill made lots of excuses about not being a real cook, but breakfast tasted just fine. Another 18km later was the Rancharia Lodge. I stopped and had a smaller bite to eat here as would be last spot for 100km. Also surprised to find open internet here. After the Rancharia Lodge, the road mostly followed the river and so fewer steep little climbs though did get some headwinds in compensation. At the bridge before Rancharia River leaves the route, found a nice spot to camp. Only 86km for the day but that also left only 60km for day three. 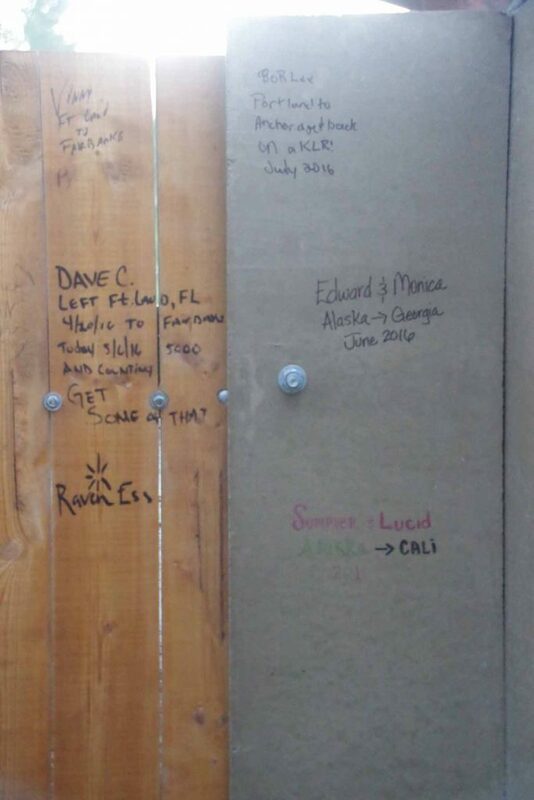 One thing I do find interesting is a lot of the graffiti on the outhouse walls is of the form “we were here” from travelers on their way to or from Alaska. I didn’t add to it. 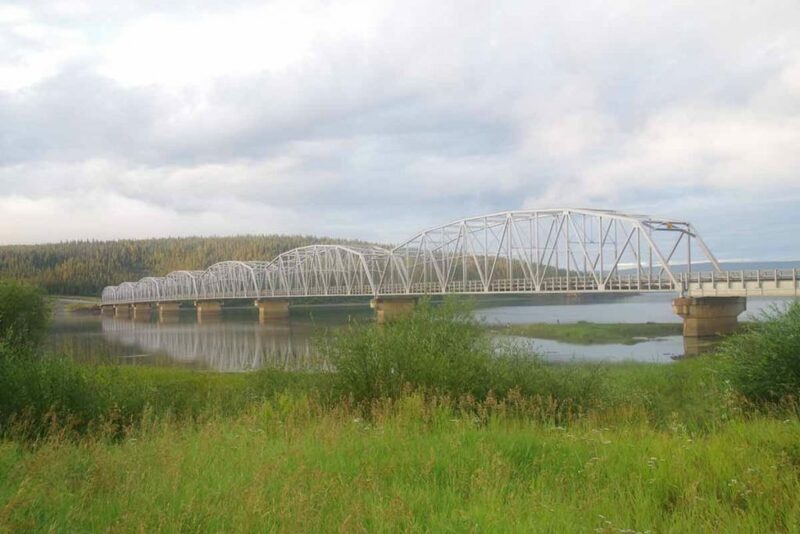 Here is a picture of that Rancharia River bridge. Also interesting to me that they built the original road in 8 or 9 months and just punched through whatever they needed to bulldoze a road. 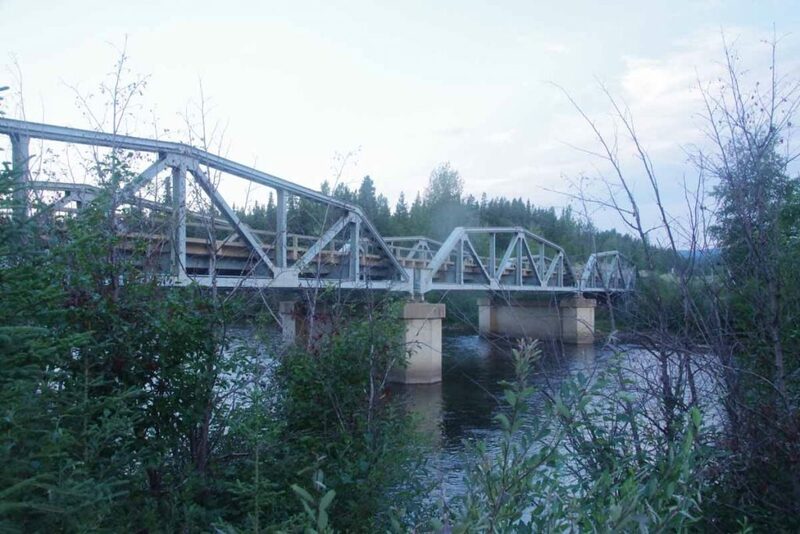 However, now 74 years later it is clear the bridge crossings have been upgraded and the overall road grading is gentle grades sometimes high and above the small creek/drainage crossings. That makes it a bit of a guess to find the ones that might allow some type of access so you can camp and also get water from the rivers. Third day was a shorter and not as tough day. However, still a number of hills to cross as you can see above the road crossed several drainages. Without too much difficulty made my way into Nugget City and was a able to check into a room for two nights here. The photo above gives a good overview of the two different road choices from here to Prince George. 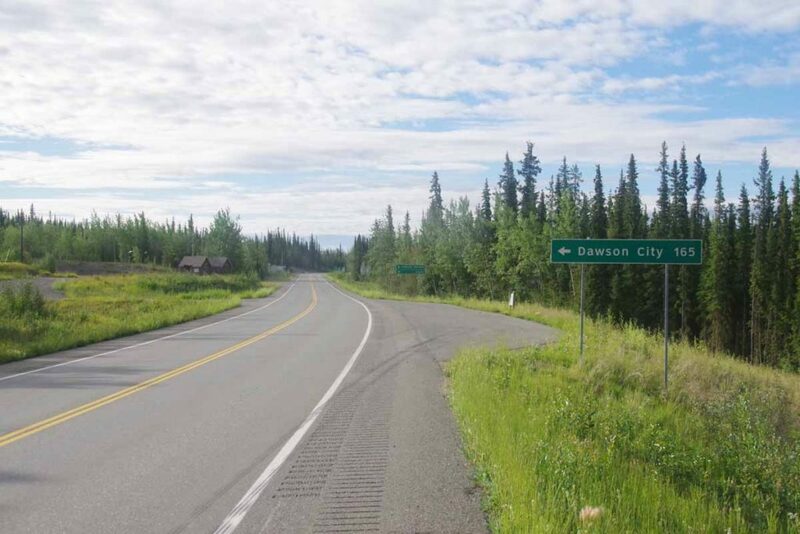 One way would be to continue to the end of the Alaska Highway at Dawson Creek. This route is ~100km shorter. 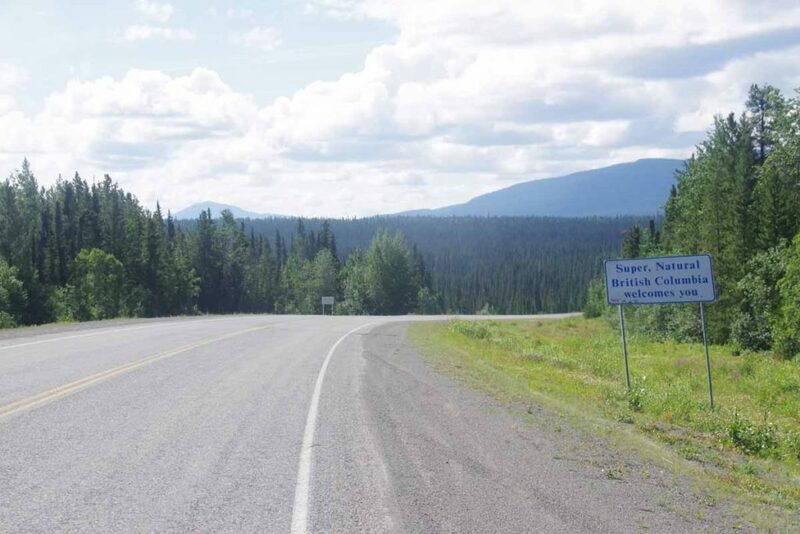 The other way is to now go down the Cassiar Highway via Dease Lake and Smithers. 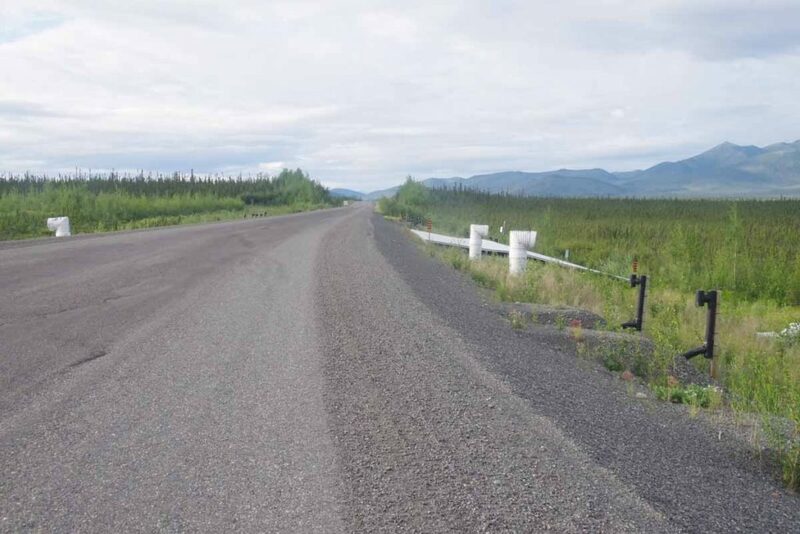 This road has been upgraded recently and is now supposed to be all paved. 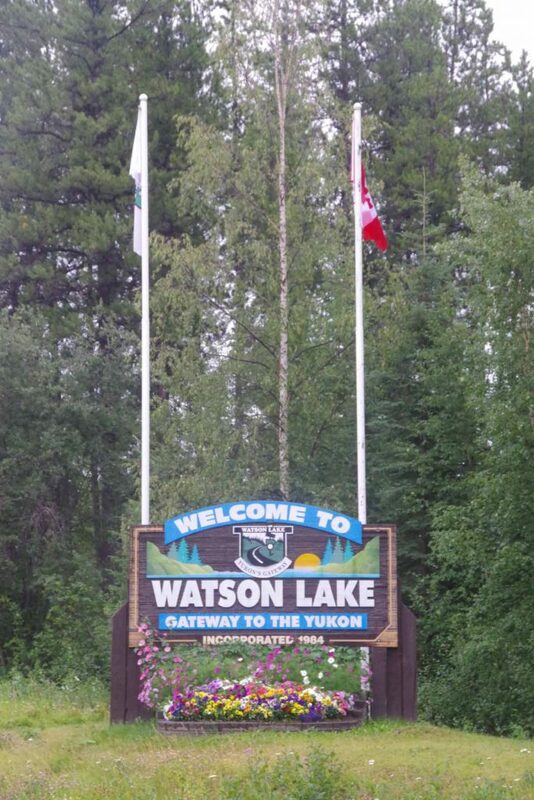 There will still be some gaps between services so may need to cycle into Watson Lake tomorrow to get some groceries. This marks ~4 weeks on the road since leaving Deadhorse. I still haven’t seen stars in the sky. There is now 6 hours between sunset ~11pm and sunrise ~5am but it doesn’t go very far below the horizon so not really dark (or I’m asleep in too much of this time). However, I was able to notice a nice moon last night around 1am, so expect to see more dark in next weeks as I head more directly south. 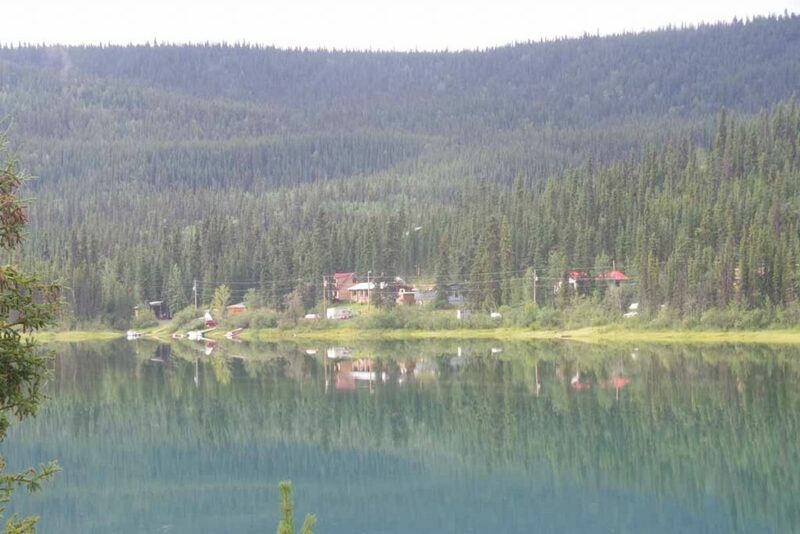 Two days of cycling brought me further to Teslin a small community 180km away from Whitehorse and on the shore of Lake Teslin. 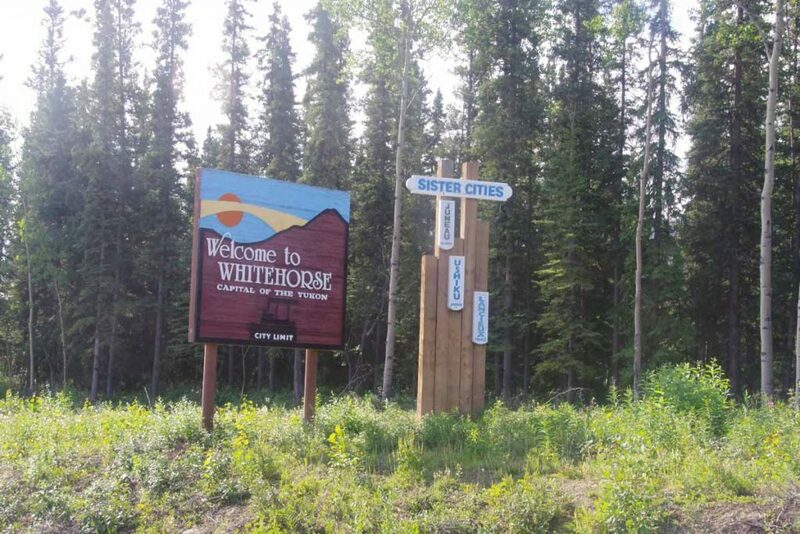 I was well rested as I left the big city of Whitehorse behind. 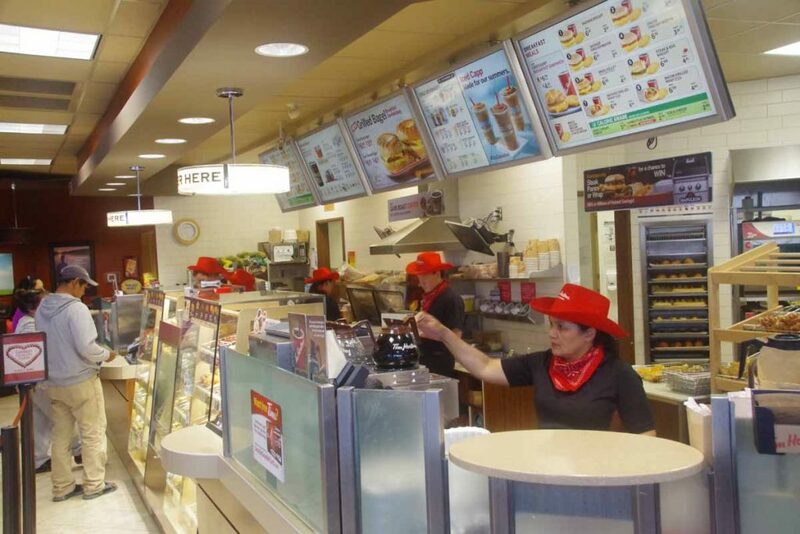 I’m told the photo above is the last Tim Hortons I will see until I reach Smithers, ~1200km from Whitehorse. Also last bike shop. Hopefully won’t need either a bike shop or Tim Hortons before then. Overcast skies but pretty much stayed dry all day. 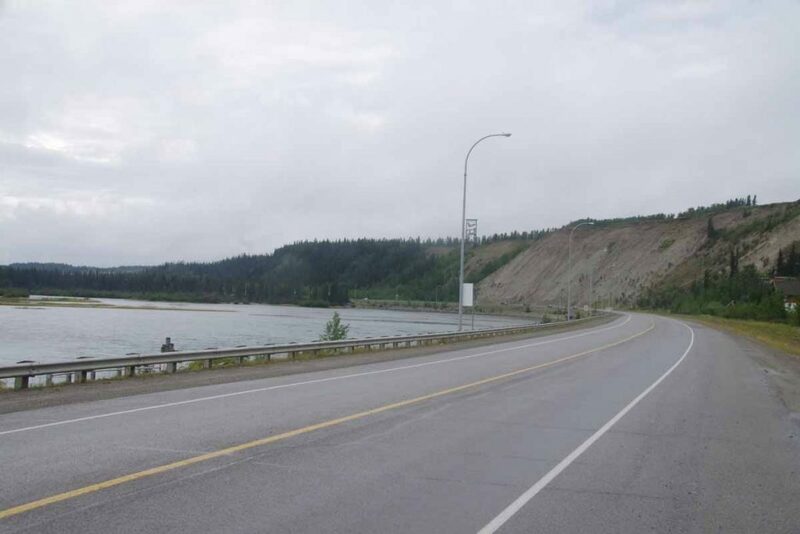 The road started up along the Yukon River and then quickly climbed the escarpment to reach the Alaska Highway at 7km. 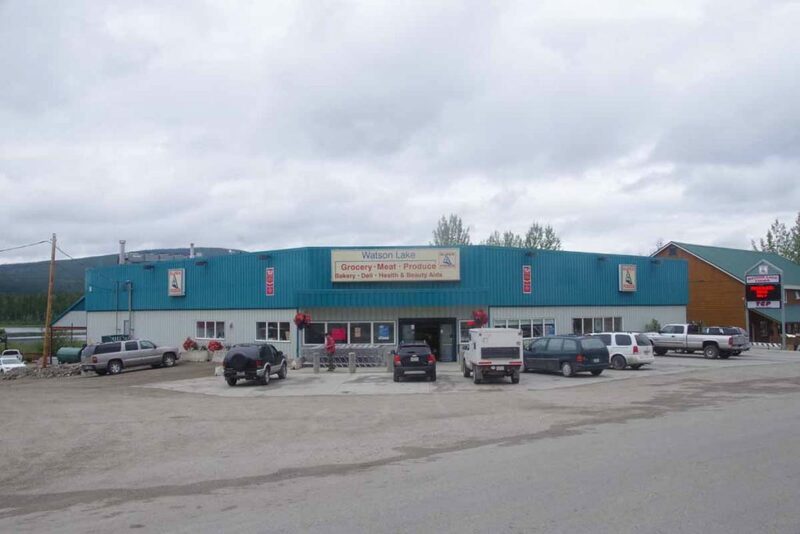 Went along some roadside businesses but overall Whitehorse is fairly sprawled out. At 21km I took a break at the cutoff to the Klondike Highway I had taken yesterday (in the bus) that led to Carcross and Skagway. There were signs here that told which weekends were “non-motorized” in the winter, presumably to give cross country skies some time without snow mobiles as well. 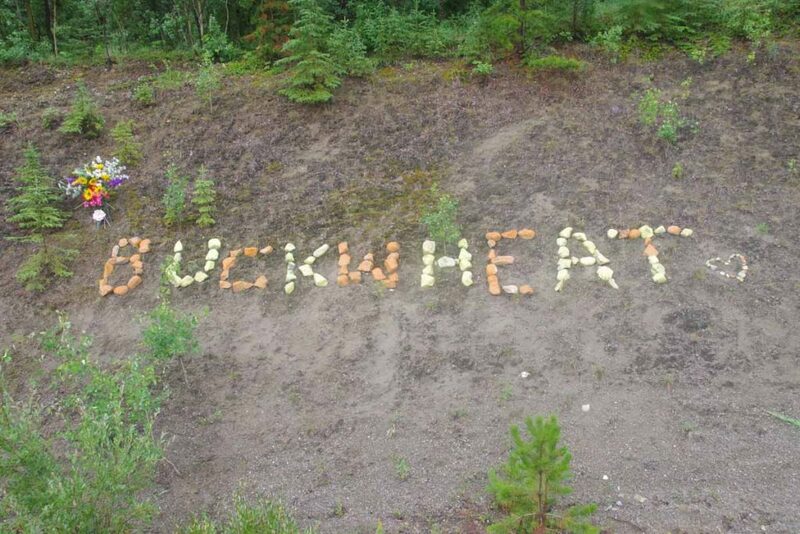 Not sure who Buckwheat is but friends made a nice memorial along the road. 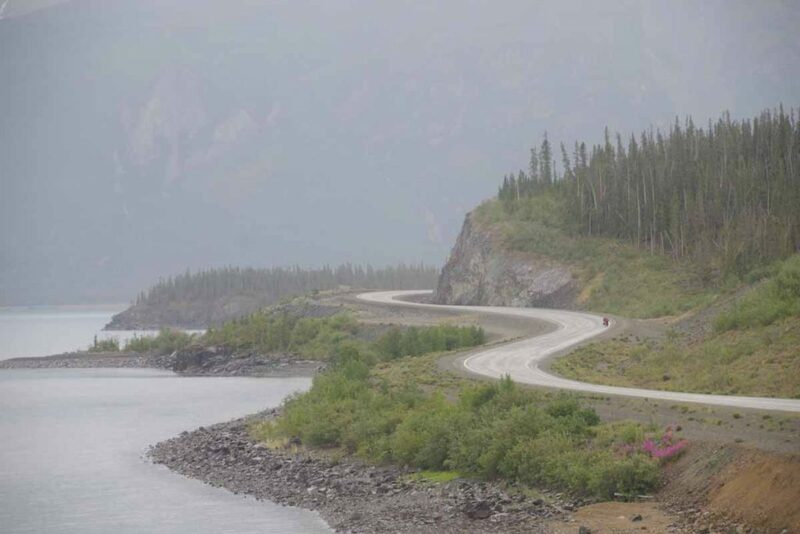 At 32 km the road descended and crossed the Yukon River. Nice little park here as well as boat ramp. The road then paralleled Marsh Lake for next 30km. Some was right along the lake, but most seemed to climb and descend little hills along the banks. I saw three cyclists the first day – coming the other way. 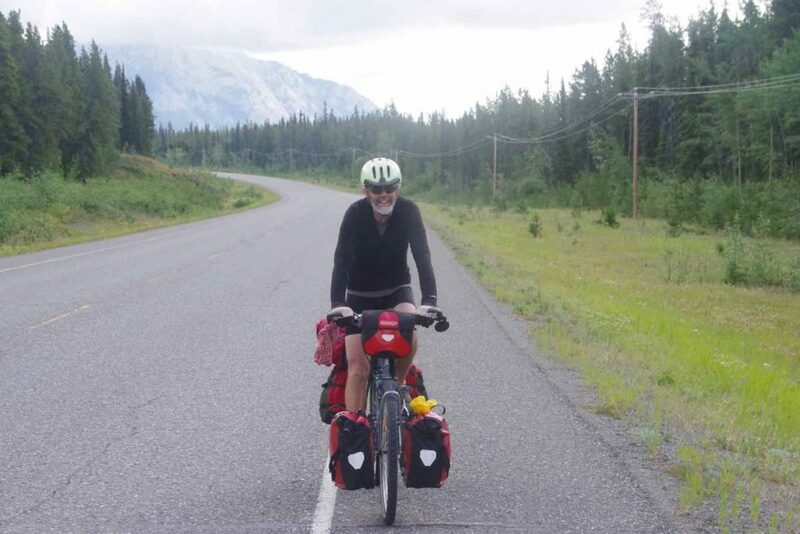 Above was one of a brother and sister who were cycling up to Whitehorse and then Inuvik. 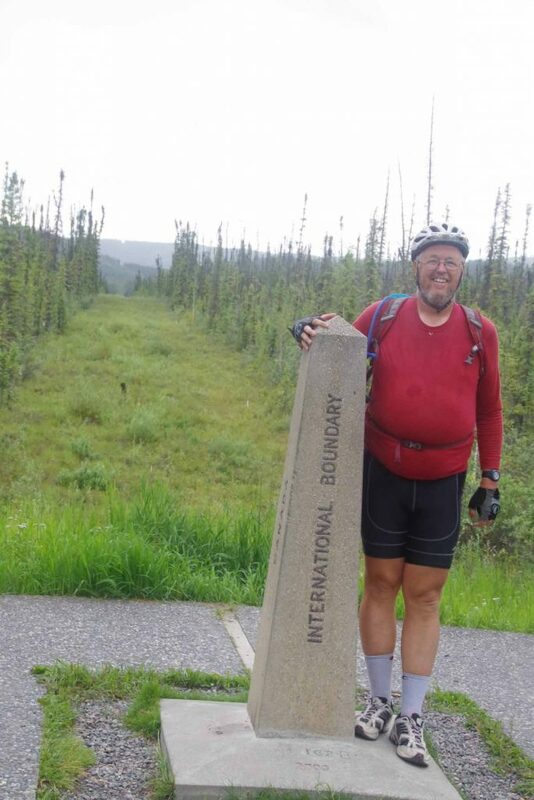 Prior to that also came across Paul who was also cycling to Inuvik. It was nice to stop along the way and compare notes about upcoming road conditions and services. At 84km was Jake’s crossing and a chance to get a late lunch. Matthias from Leipzig was another cyclist who started after I had from Deadhorse and was headed to Calgary. 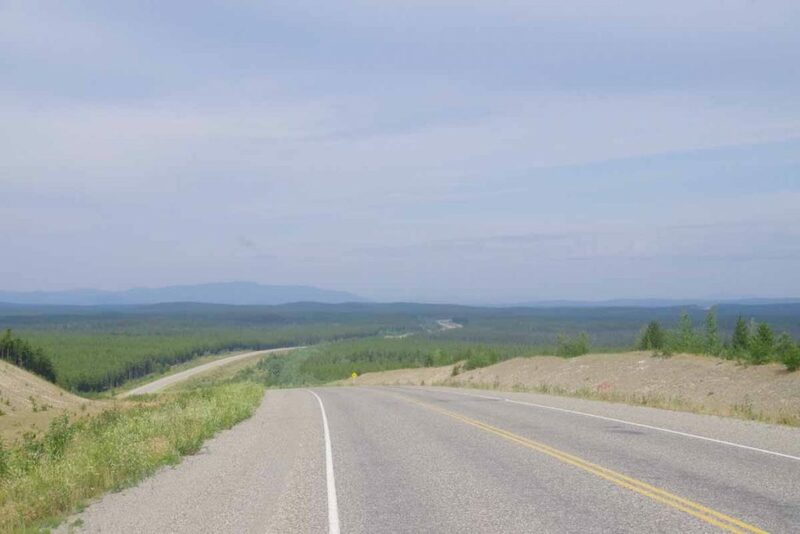 He had gone longer miles per day and actually leapfrogged ahead but then spent two rest days in Whitehorse so rode from there this first day as well. 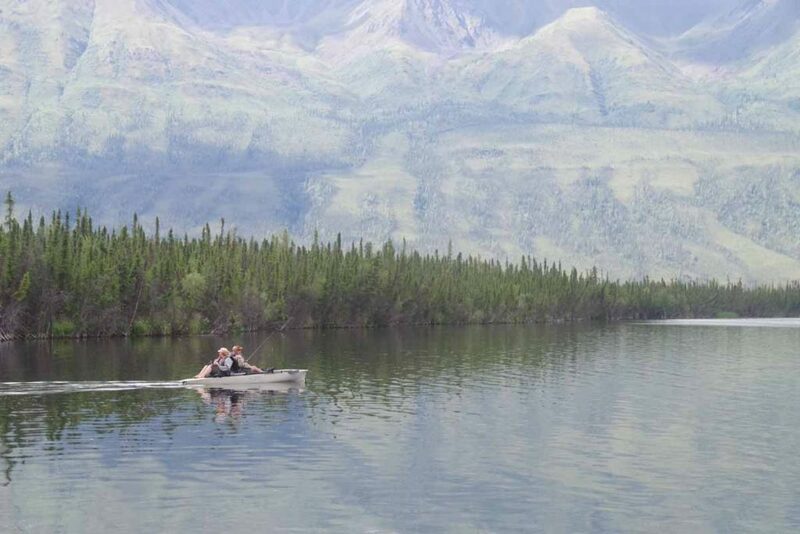 There was a German fellow with a canoe who had paddled from Whitehorse along the rivers/lakes was now making his way back. There was a German couple in the overland vehicle below. They had gone up to Prudhoe Bay and were now slowly winding their way south, eventually also via Latin America. All German speaking and all on an extended holiday. I get the sense most of those in RVs are US as well as a reasonable share of those on on motorcycles. However cyclists is a smaller share of those from US. On several occasions so far, folks initially guess my nationality as Canadian. Not sure why, but perhaps I’m picking up lingo, eh? Or perhaps just fewer of my age group doing these types of extended trips? We got some rain overnight, but campground had a nice cooking shelter so bike was dry. On second day, had a breakfast in camp and then cycled 20km down the road to reach a second breakfast at Johnson’s Crossing. Nice RV park and café here. 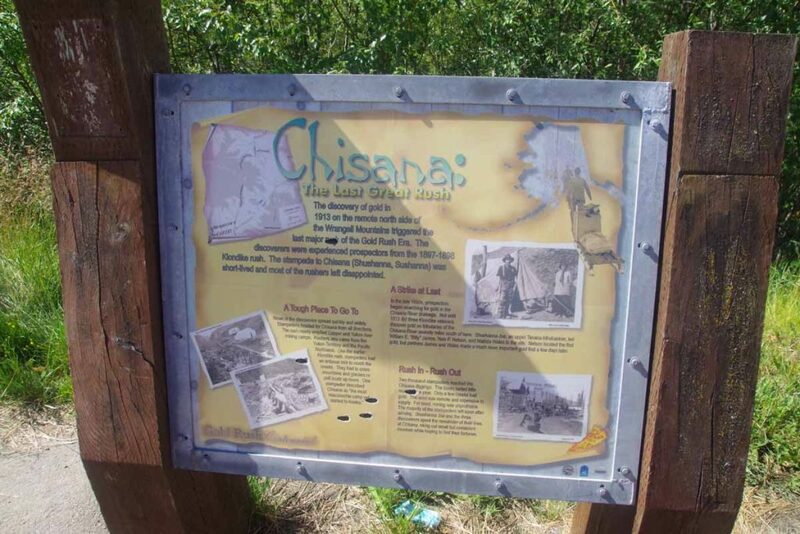 It was located at the Teslin River Bridge. 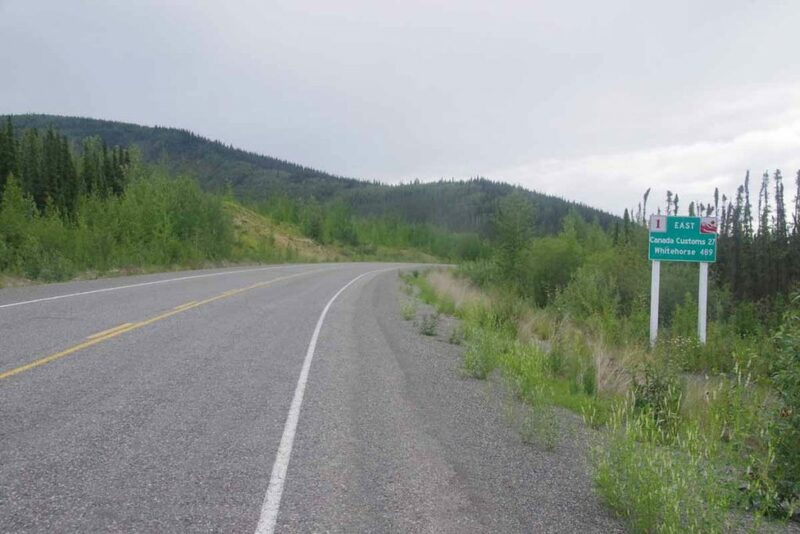 Also the intersection with the Canol road. 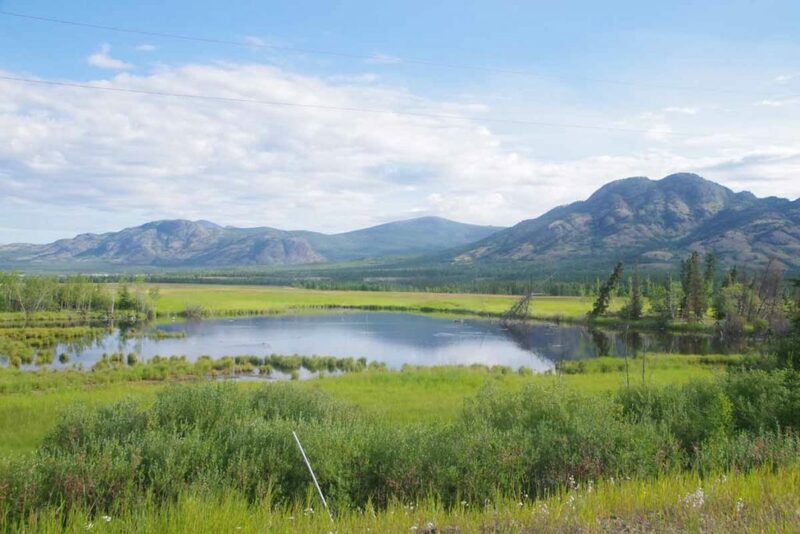 A short-lived project conceived to build a pipeline from Norman Wells some ~500km away and pump through the wilderness. The road and pipeline were abandoned in 1944 after the war scare passed and more economical sources of oil could be found. However the first half of the road is still here as a rugged road. A little bit later I came across Shon and Jihyun a Korean couple cycling on a tandem. 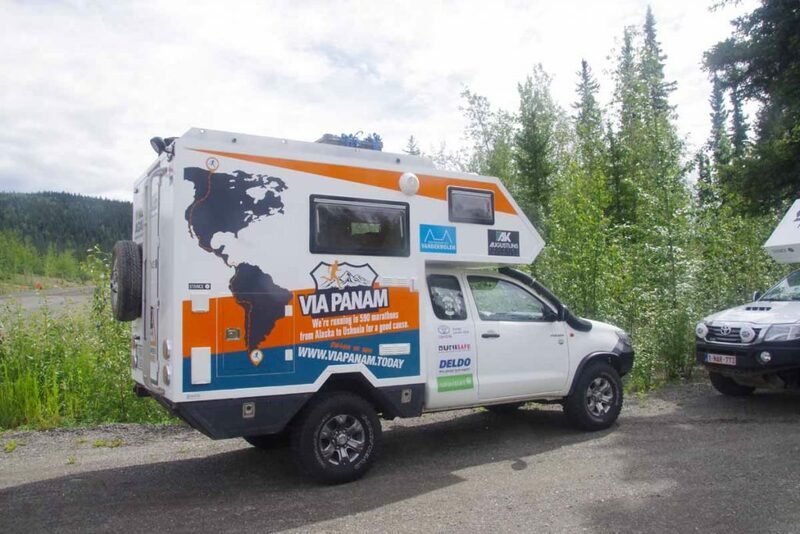 Their bags said “Alaska/Argentina” and they had started in Ushuaia three years ago and were on their way to Prudhoe Bay. Wow! It was fun get a few glimpses of their trip. From here cycled the last bits to Teslin. The second day was a shorter day of only 72km and a somewhat easier day before doing a three day stretch across to Watson Lake. Today decided to avoid the bike and instead become a tourist. 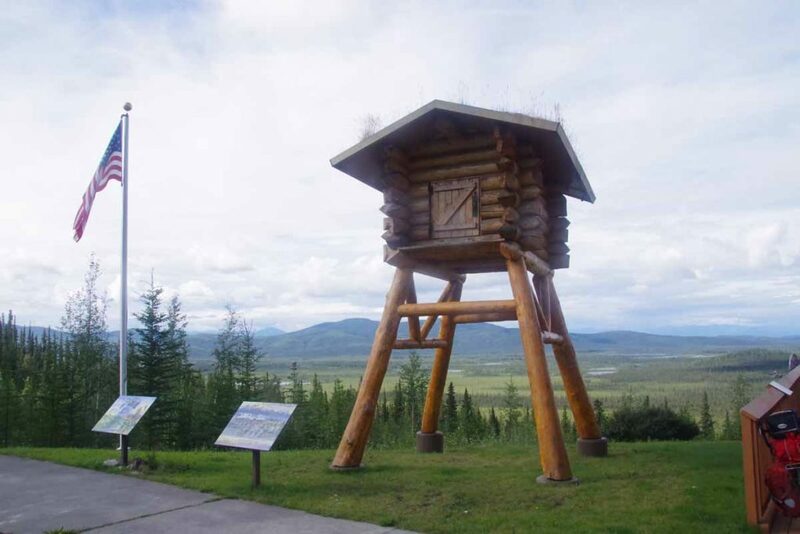 This area has been shaped by several events from the past, particularly the Klondike Gold Rush and the construction of the Alaska Highway in the second world war. 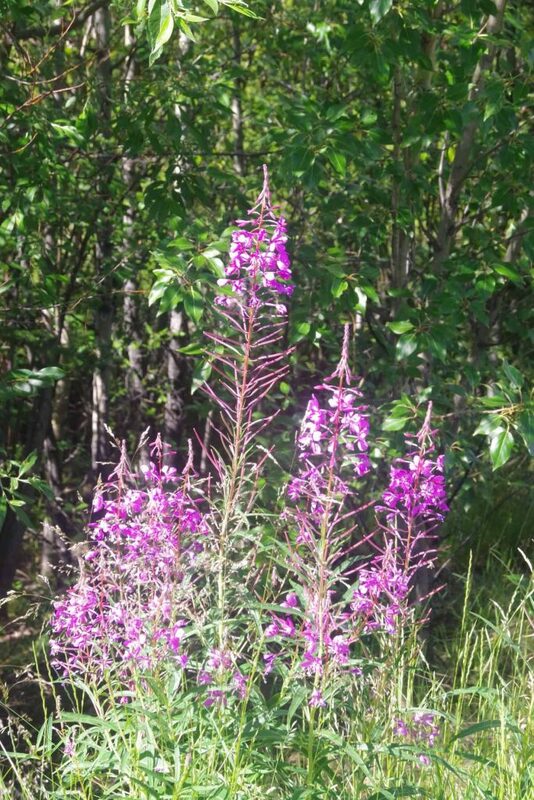 Gold was found near Dawson City in 1896 leading to ~100,000 people “stampeding” on their way to riches and fortunes. 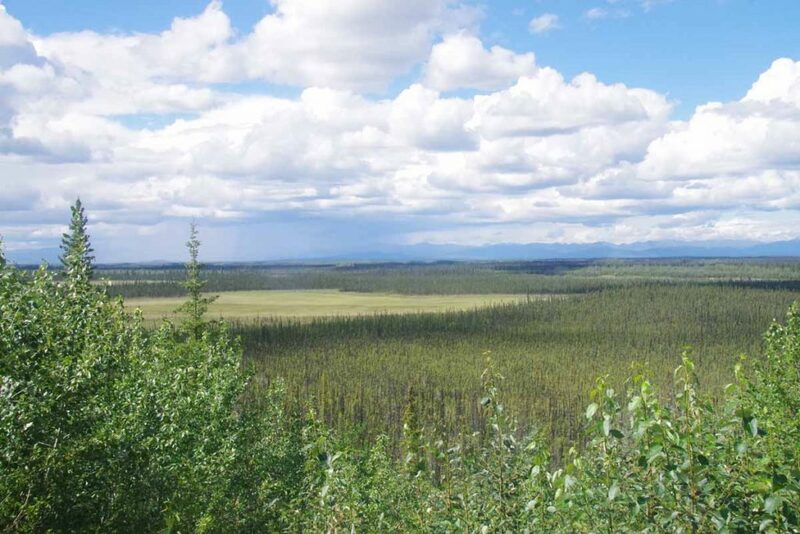 Problem was the gold was very remote, ~500km north of here along the Yukon River valley. Steamships going up the Yukon were slow and only could go some of the year. 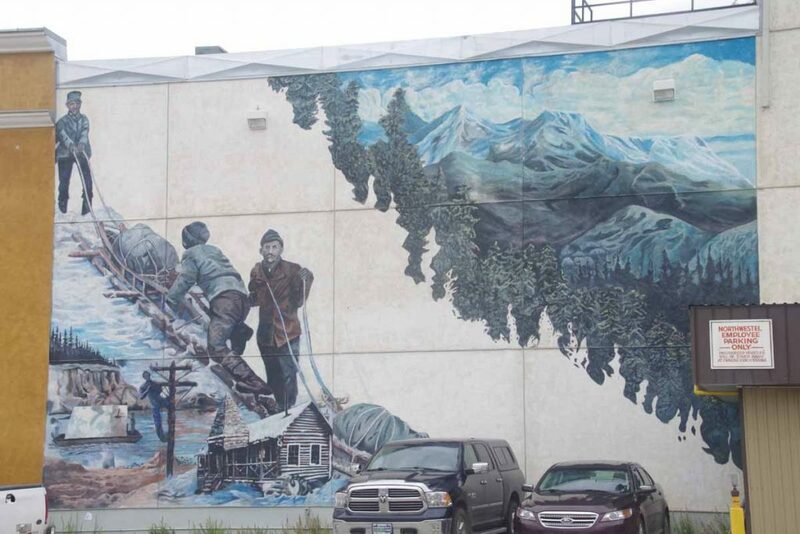 Hence, many of the folks on their way to the gold fields went first to Skagway, Alaska where there is deep water port and then just a matter of climbing ~3000ft over the coastal range, building a boat and floating down the Yukon. 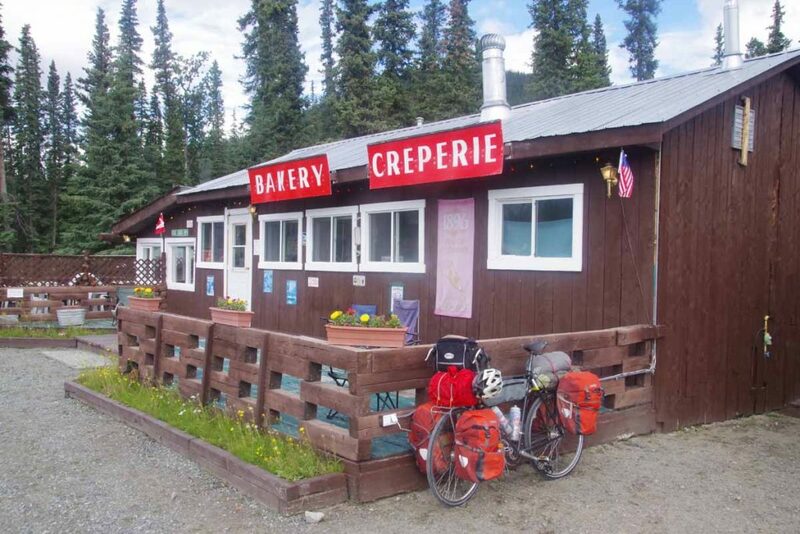 The Canadian RCMP wanted to make sure those traveling had sufficient goods to survive and hence enforced particular limits amounts of flour, sugar and other goods (link from previous bike trip) – the total weight usually totaling to a ton. All of this had to be carried to top of the passes, requiring many trips. 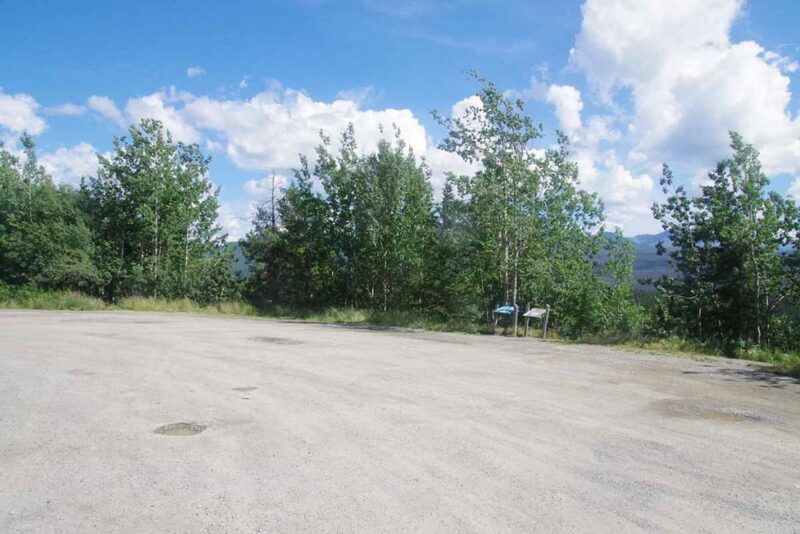 By 1900 a railroad was built to top of the pass and then on to Whitehorse. While the largest boom of the stampede was past, that railroad continued to run until 1982 including a particularly busy time in WWII to help construct the road. By 1988, the railroad was opened back up – but this time for tourists. 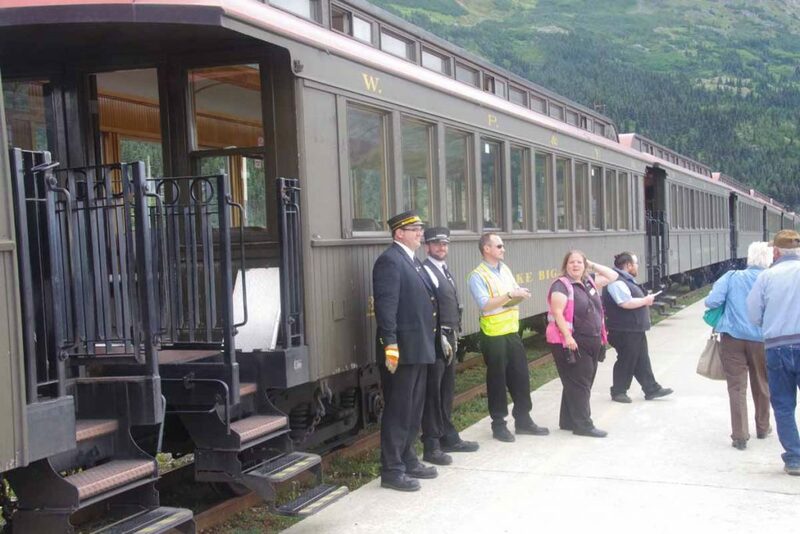 My goal for the day was to take a tour on the railroad as well as visit Skagway. 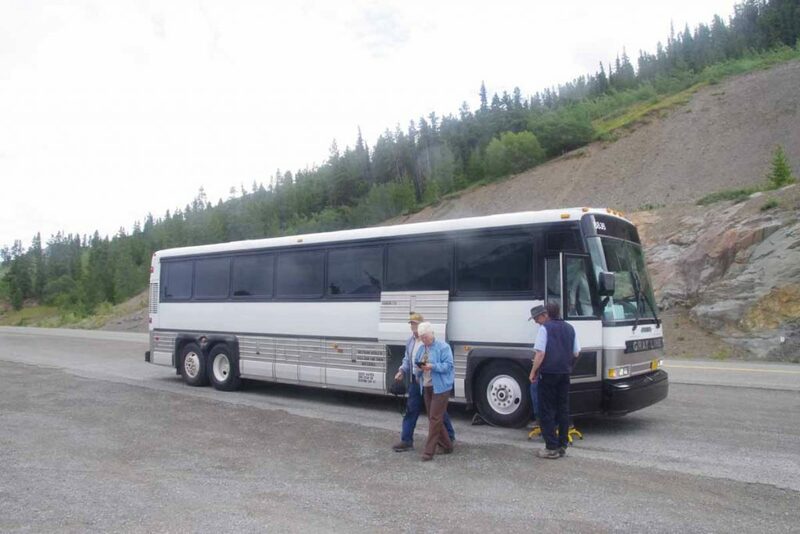 The railroad lines into Whitehorse have been abandoned, so we started with a bus ride. 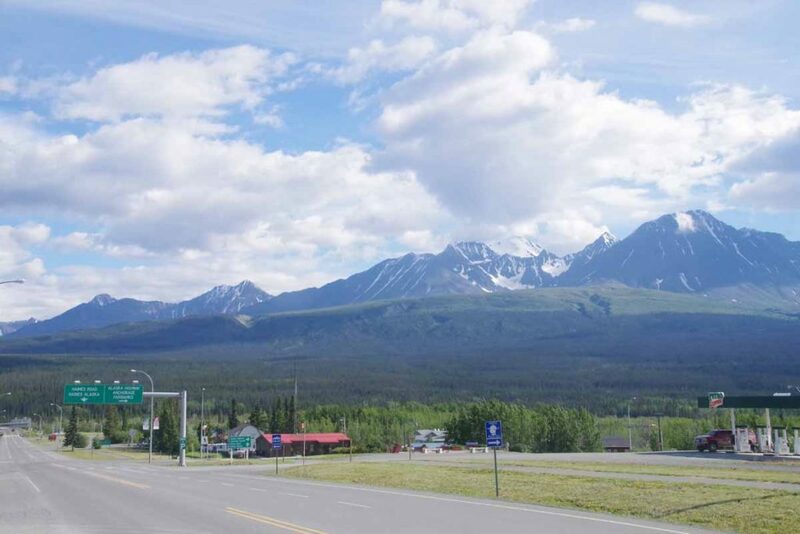 Down the Alaska Highway and then on the Klondike Highway past Carcross where we took a short break. 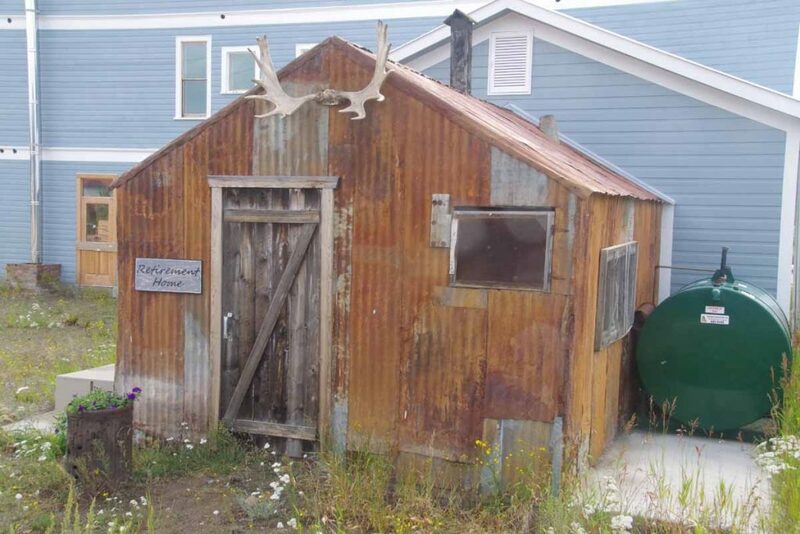 Carcross retirement home shown below. At Frasier we boarded the narrow gauge railroad. This was 27.7 miles from Skagway. After a short climb we came to the top of White Pass as well as the US/Canada border. 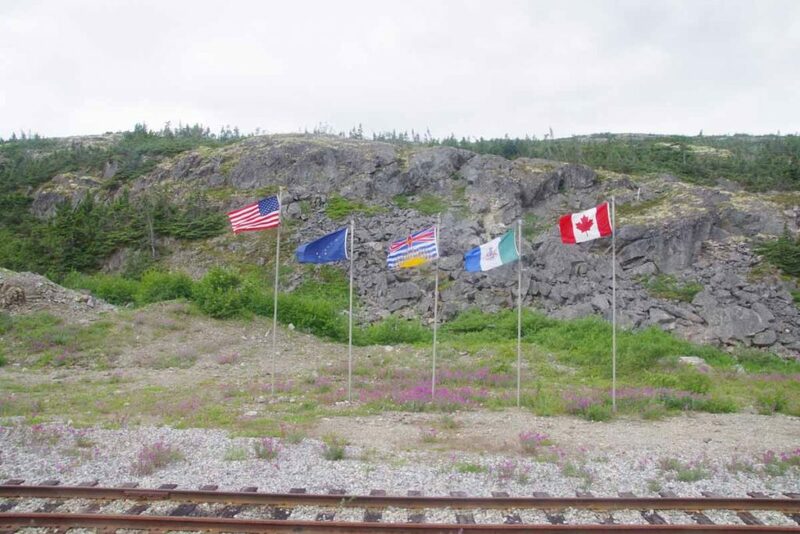 Below are flags from US, Alaska, British Columbia, Yukon Territory and Canada. It was a rather scenic ride down the valley. 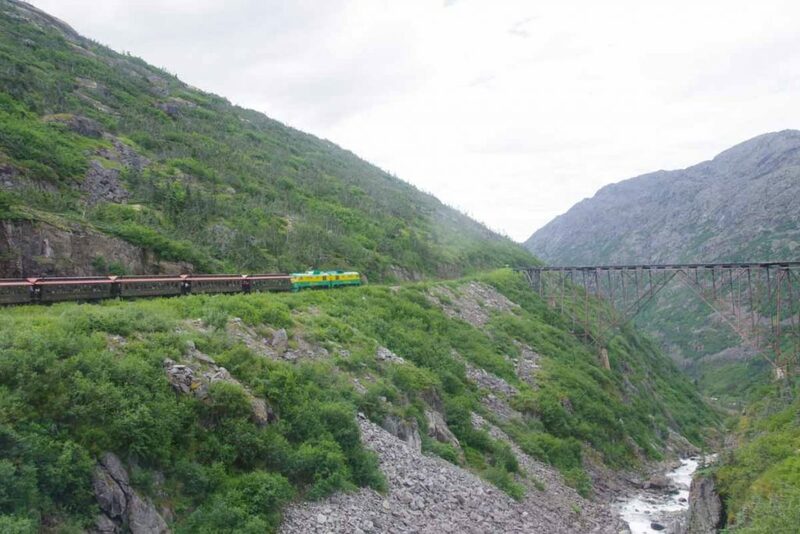 One could see the narrow tracks, steep cliffs and great views as the train slowly inched its way down. About two hours later we found our way down to sea level and in the town of Skagway. It took a bit to clear US customs and then I was in the town. 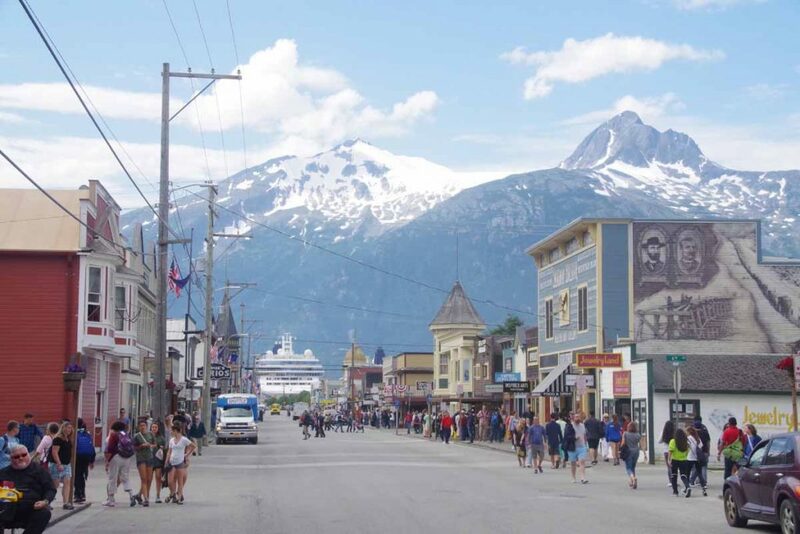 I think Skagway is a rather strange town. A beautiful scenic location, but also extremely influenced by the ~900,000 visitors each summer that come from the cruise ships that dock in the harbor. 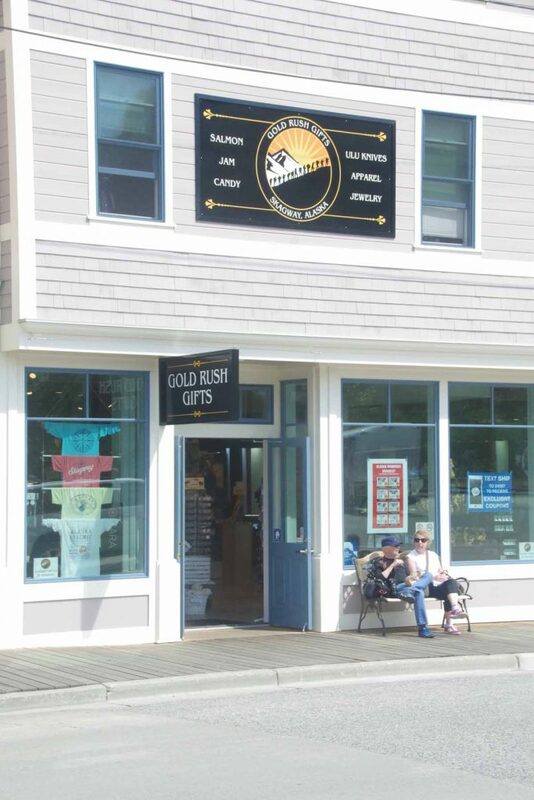 As a result, everything in the first eight blocks seems to be oriented towards having these cruise ship passengers get off their boats and buy or do something to get their Alaska experiences or souvenirs. In 2000, I did a cycle trip from Haines to Skagway and then I remember a preponderance of moose towels for sale. By now there seem to be a number of different things: (a) gold and jewelry (b) T-shirts, hats and other types of apparel (c) food (d) tours or quick experiences, e.g. Sockeye cycle would haul you up the road and let you ride down (e) various knickknacks in the “Alaska” category like towels, magnets and similar. 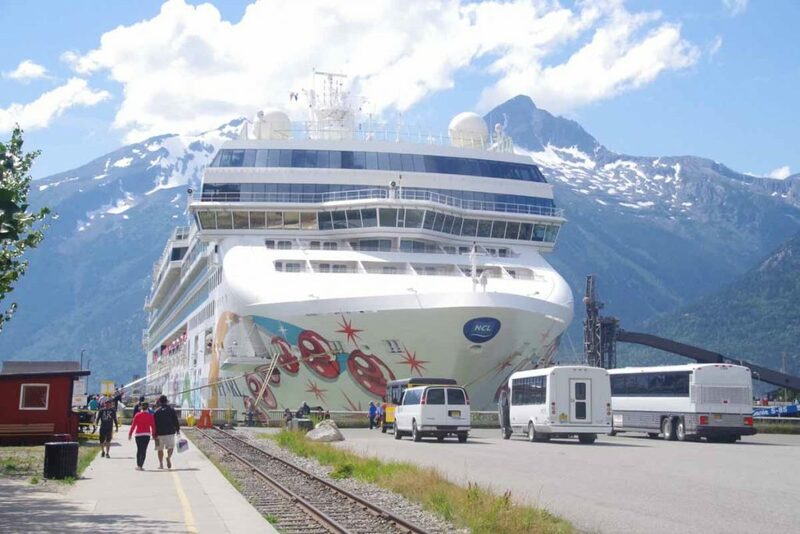 Skagway can handle up to four large cruise ships at a time. Today was a “four ship day”. I was told every other Sunday was a “one ship day” but other days are all busier. 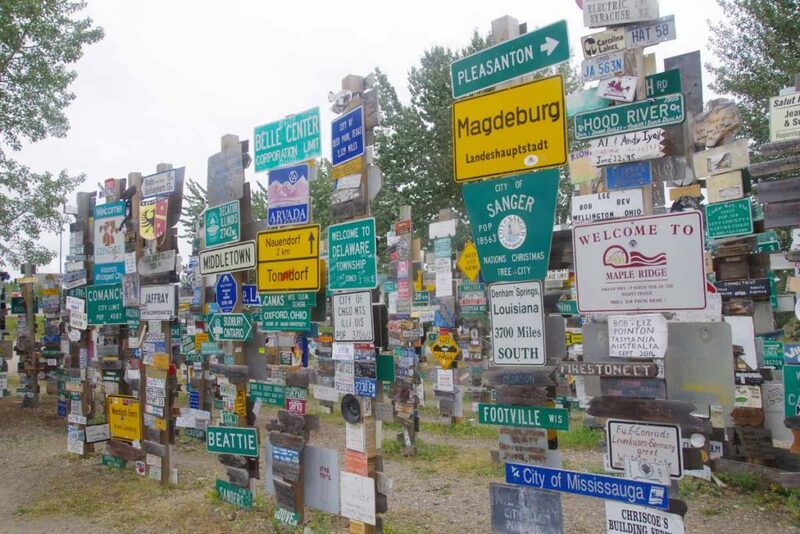 Signs on the load streets suggest this madness all lasts from May 1st to October 1st and then Skagway somehow becomes something different. 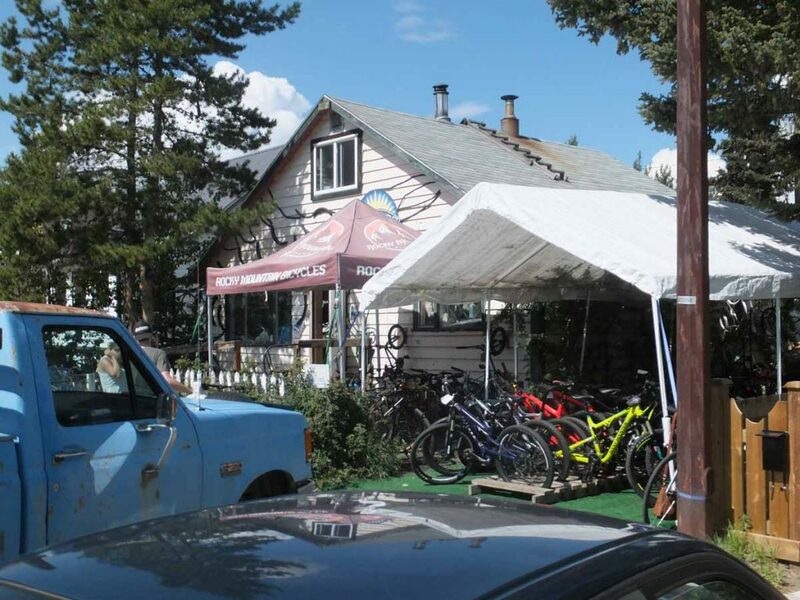 I did find the local bicycle shop (Sockeye cycles) and was able to buy a tube here. A brief bit of background. While today was a tourist day without cycling, I had tried installing a new front tire last night. The tire stayed briefly on and then slipped off the rim, “pow!”. Yikes, hopefully just bad mounting on my part, but I was a bit cautious. I put a new tire back on and partially inflated (30 psi) and made sure all was seated well. This morning before I left, I increased to 50 psi. After coming back from the tour, I went the full 70 psi and cycled unloaded some around town. It does seem to be ok. 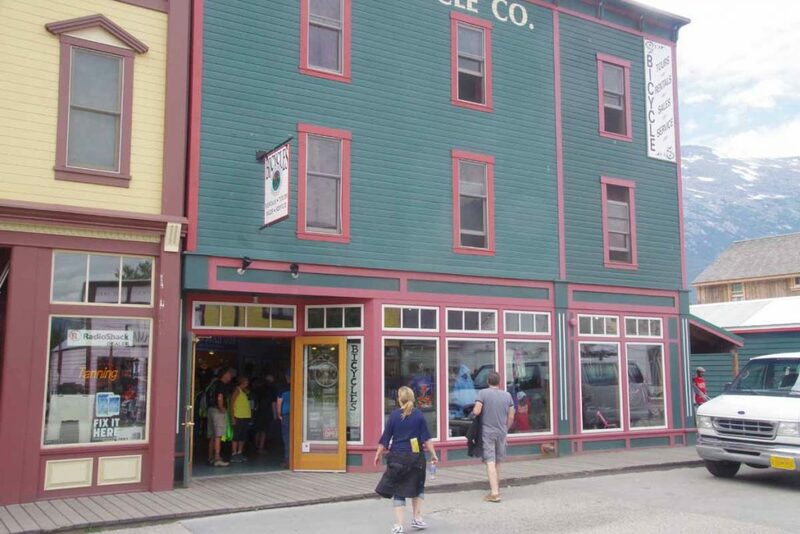 However, at Sockeye cycles I was able to get an extra tube and also noticed they sell good 700x35C Schwalbe as well. 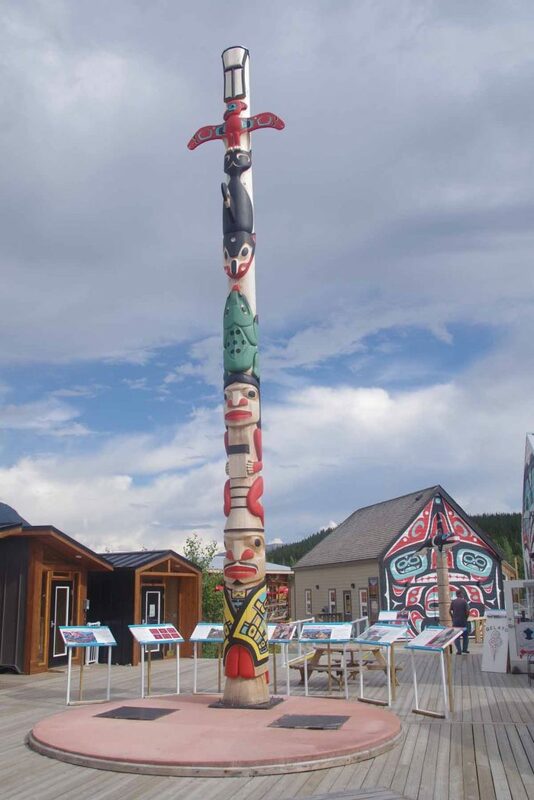 On the way back we stopped briefly in Carcross and then back into Whitehorse. Too late for local sport shops to be open, but there is a large Canadian Tire store that seemed to have most of what I needed. Overall a fun and different day as a tourist. Tomorrow will pack up and back on the road. 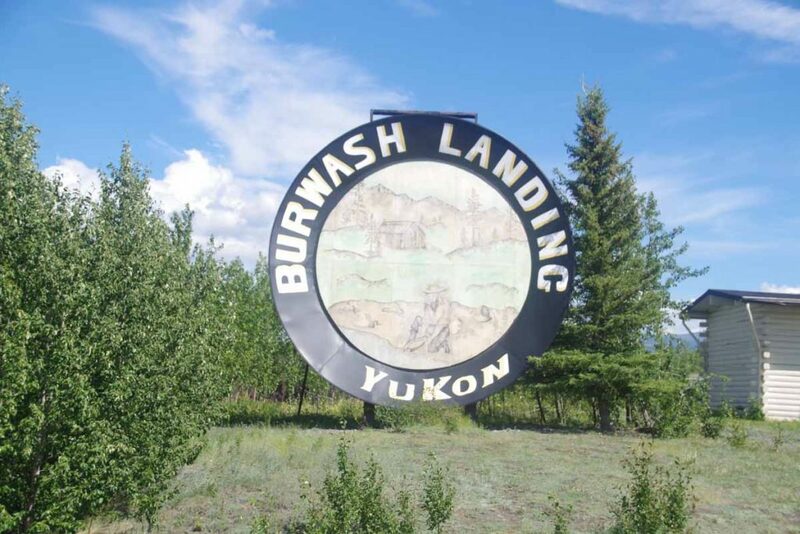 Expect approximately five days from here along the Alaska Highway to reach Watson Lake (two to Teslin and three from Teslin to Watson Lake). 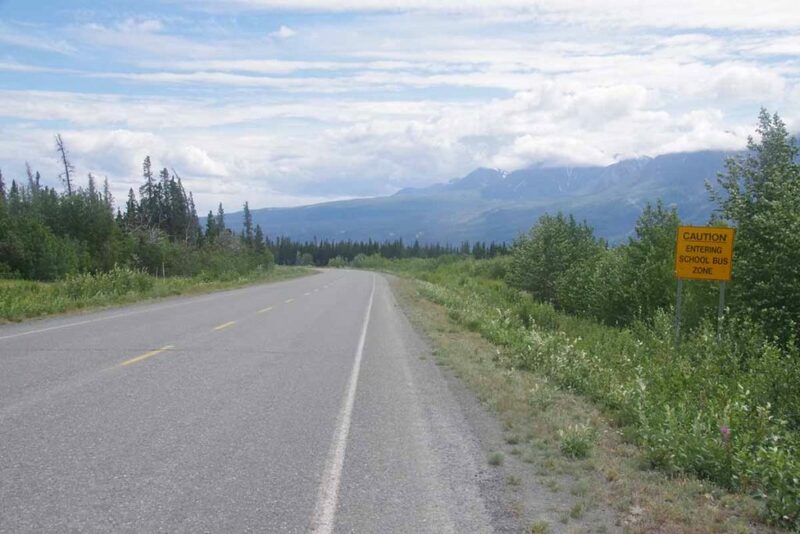 I figured I would ride the 100 miles from Haines Junction to Whitehorse in two not very difficult days. I had cycled this road twice before both times in a day, but even then it was a long day. It was a cool morning and all was riding well as I departed around 7:30am. Past the airport and soon in the more rural areas. However, I did notice a few more “subdivisions” in this segment, so looks like more people are moving or putting summer cabins here. Around 15km, I could see a small patch of wet pavement ahead. Rather strange thing as I cycled into the sprinkling rain on the pavement and then 3km further it was dry again. It was as if a rain cloud had chosen just this small part of the road to water. Looking back I could see the rainbow in photo above. 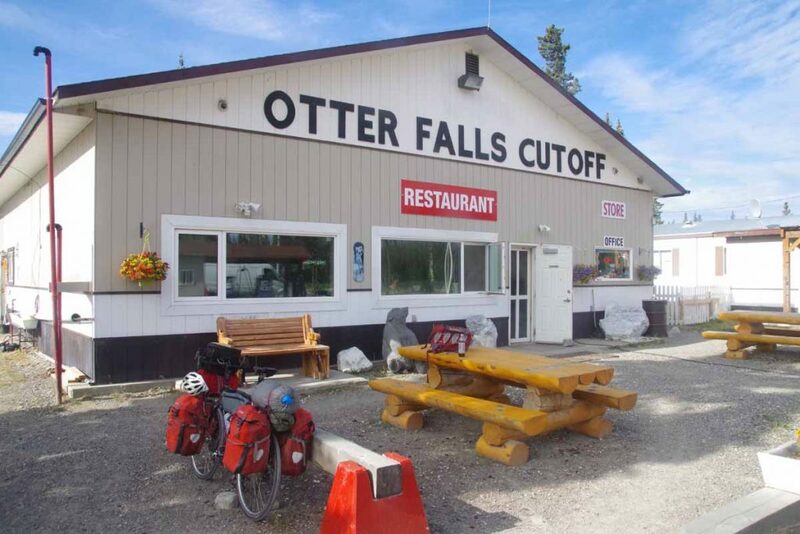 Otter Falls was at 32km and good spot to have a real breakfast. Friendly waitress who suggested I take the road past Champagne rather than the main road. Also a friendly and curious dog who mostly was trying to figure out if I’d give it a treat. The pavement was still good to this point, though started getting more chip seal after this. A few small hills to go over but overall going fast than previous days. At 59km signs told me of 8km of road construction. Lots of dust here and a hard surface that was tougher to ride. Fortunately, at 60km was the turnoff to Champagne. This was the old road until 2002 when a bypass was constructed. Champagne was a native (First Nations) village that was 5km into the road. This route was great! 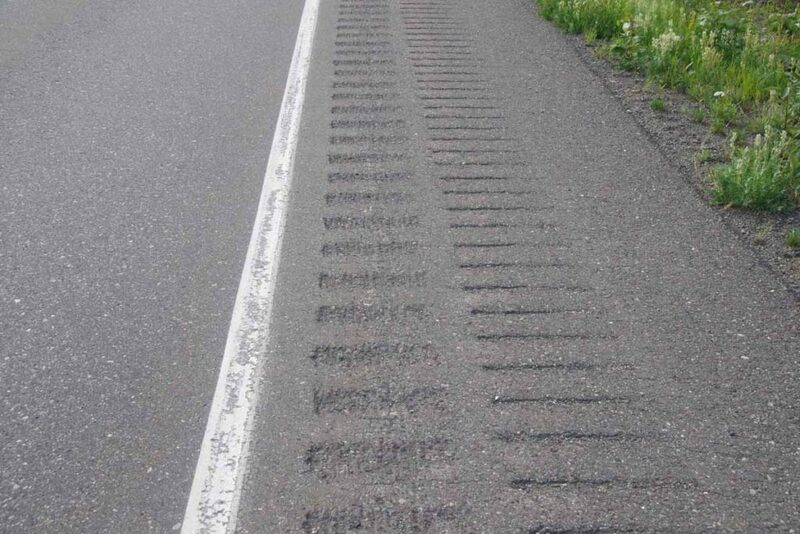 Not only was there no traffic, but the chip seal was similar in surface to the main Alaska Highway. I also got to skip 7km of dusty dirt road. There were two short steep hills but nothing too bad. The town of Champagne had a tourist information sign as well as this building with collection of hubcaps. Presumably, the collection is growing less now. 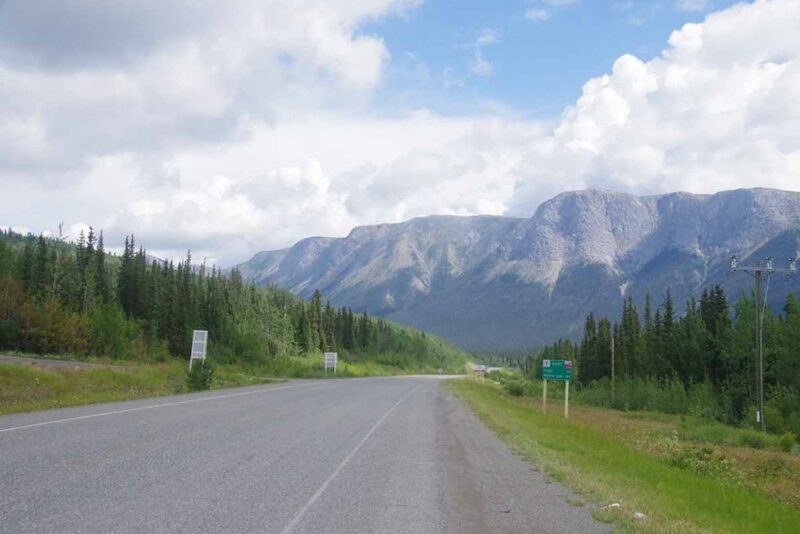 It was another 10km along the Champagne old road until I rejoined the Alaska Highway. I figured I would go a bit further and then find a spot close to water and camp for the night. Still early, but this way I would split the ride into two easy segments. 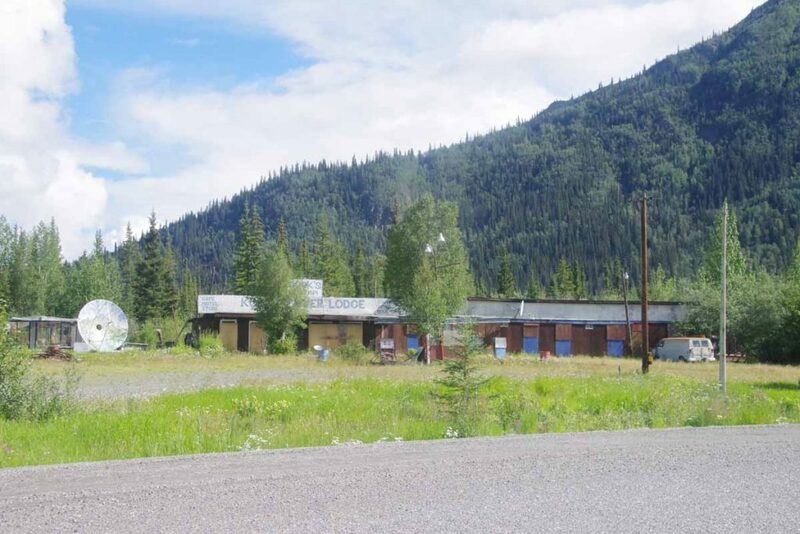 At Mendenhall there was sign for B&B/Cabins that were now “closed” and at 90km was a wayside rest area but signs for no camping as well as no water. However, 2km further the road crossed Stoney Creek. Found a lovely camp site where a side road went up to the creek and set up tent to relax for the afternoon. While I was there three different vehicles pulled up. Folks got out and either filled up water jugs and/or let a dog loose to frolick in the water. Apparently, this is where folks in Mendenhall subdivision get their water. Next morning got my bags together and set off a little past 7am. 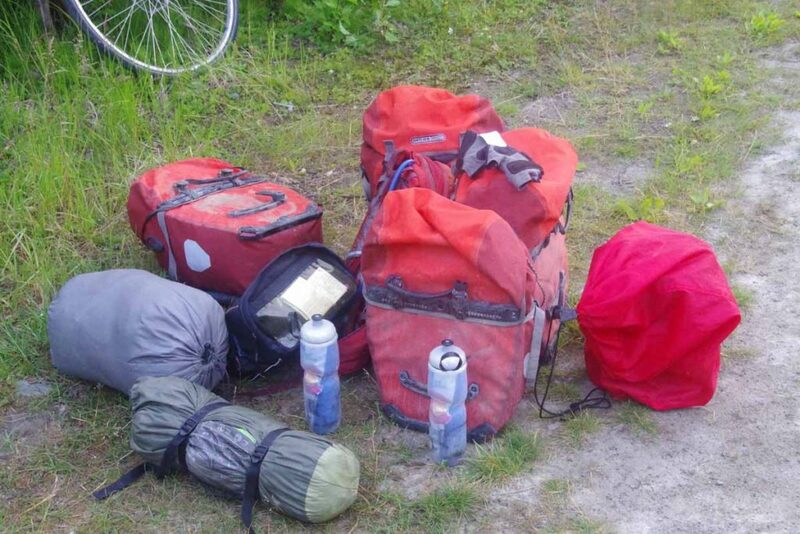 Right now I’ve got four panniers and am working through how I might reduce things to two panniers for the Great Divide Route. I should be able to do it, but will need to carefully sort through what I’m using and what not. Start of the morning always seems to go quickly with a lot of energy and fairly quickly rode past the Takhini River Bridge. This area has a region known as the Salt Flats where local water has become very alkaline and also a number of small lakes such as the one above. Either the hills increased a bit after this or I my early enthusiasm was wearing less but was getting more tired once I passed the city limits sign. near 45km. However, city limits doesn’t mean city and I had more than 15km to go. 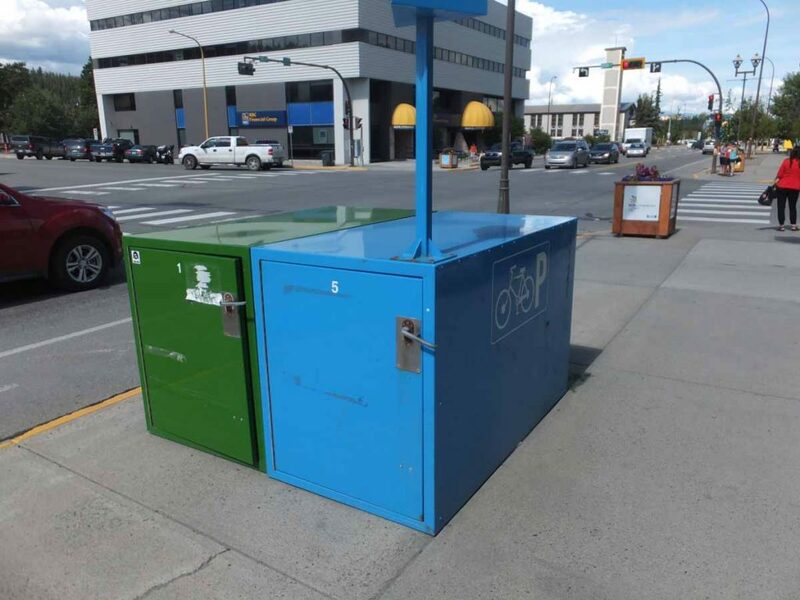 Whitehorse struck me as an interesting small/big town. In the next section the town was small enough that they could list multiple signs with services: first the gas stations, then the motels, then the other services, etc. However, this went on for nearly 10km along the road and hence the big part of it. Without too much difficulty, I got myself into the city center and found a motel. 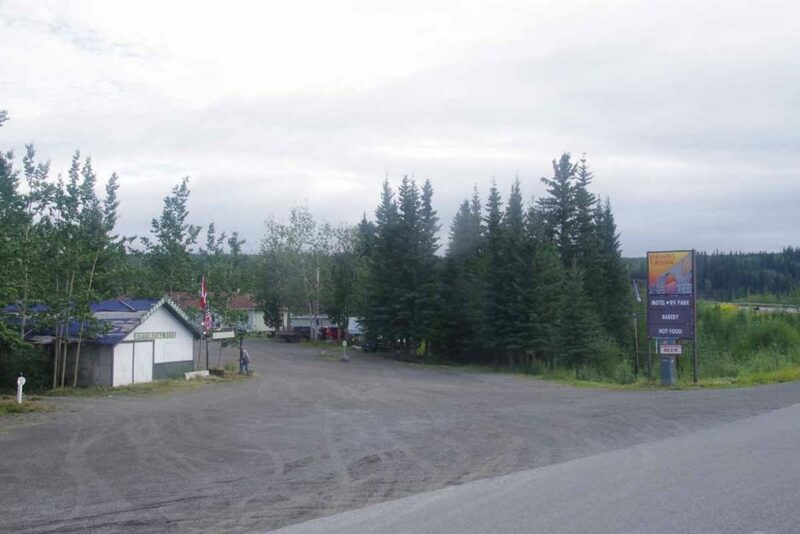 This is the first town in 1000km with a Walmart. 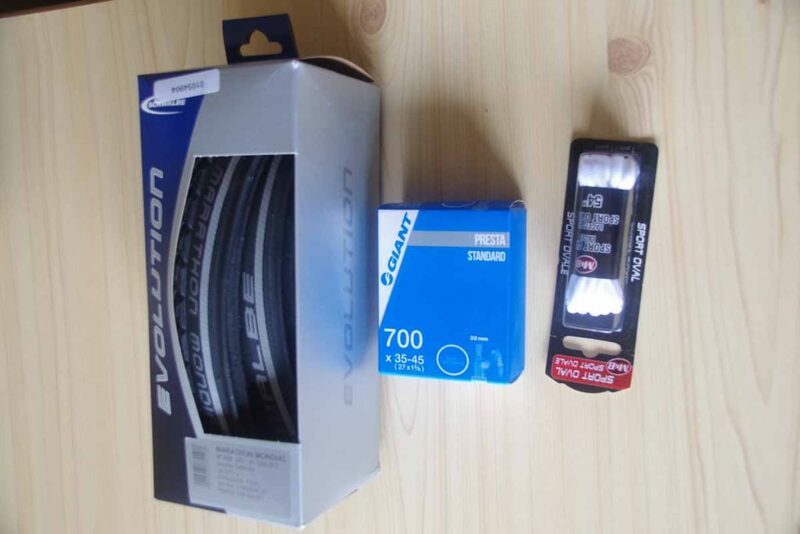 More importantly, I got several key items in my shopping list: a tire, a tube and shoelaces. There are two bike shops in town. I stopped by both and was impressed that both had reasonable Schwalbe foldable tires. My front tire went flat just as I went to the motel, but plan is to put a new tire in the front, get ride of the one with sidewall tear and use my old front tire as a spare [there will be a quiz :)]. That should last until next town with a bike shop which I’m told is Smithers BC ~1250km from here. I was even impressed that the town is big enough there are bike lockers to rent and store a bike. I’ve wandered around to the Walmart, past the downtown as well as visited both bike shops. 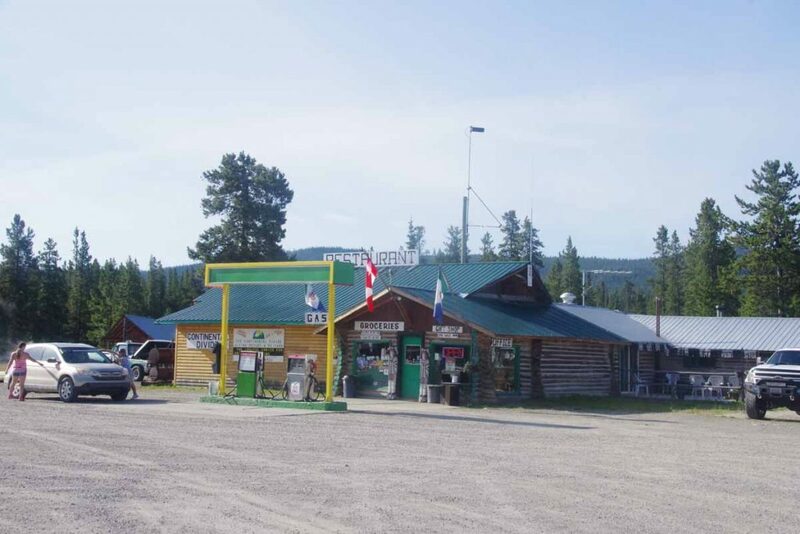 Plan for tomorrow is to take a rest day here and be a tourist before doing the next section to Watson Lake. It is nice being in a big city even if the population is ~25,000 or so. Today the rain made for a tougher day than it otherwise would have been. Forecasts told me 80% chance in Destruction Bay (my starting point) and only 30% chance in Haines Junction (my ending point), so figured it would only be getting better. Skies were overcast but otherwise dry and 10C (50F) when I started out. Fortunately, no more headwinds from yesterday. Slowly going down the road when at 13km, my front tire went flat. The tire has some small holes and something must have gotten in to puncture. I patched the tube but it already had four patches so also swapped in a new tube. Took my time carefully getting everything right. As I was doing this it started to sprinkle. Put on my rain jacket anyways and from that point until 80km point, it never stopped raining. At 26km, I came past an RV park and right at this point, Dave and Sarah came out. They had stayed there last night at a nice spot right along the lake. In this stretch the road followed the coast and if you look closely on photo above, you can see them cycling on the bend. The road followed the lake around the next turn and suddenly the headwind was back. Coming due from south. The rain increased and temperature dropped to ~7C (45F). It was tough and cold riding. Up ahead at 36km was a small visitor area where I stopped in to warm up. 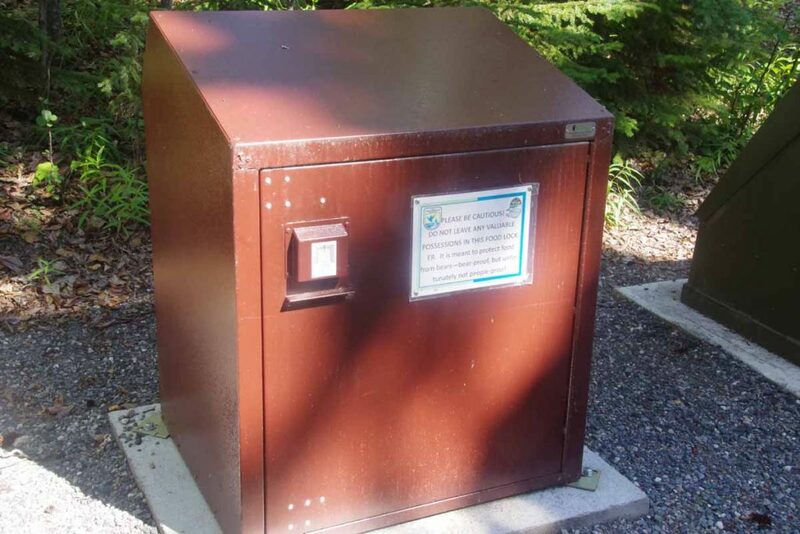 Had nice exhibits about the Kluane Wilderness area and also one could rent bear canisters here and then return them in a “bear canister drop box”. Fortunately, after visitor area the road followed the lake shore around and then down wind. Still wet but better. At 44km the road also started to slowly climb away from the lake. 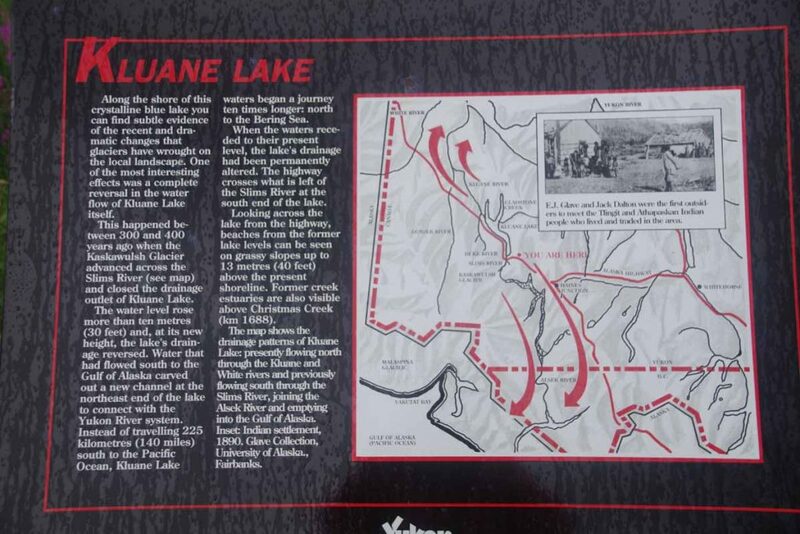 The photo above was one of the plaques at 50km rest area. The summit was at 52km and then a quick drop and then climbing again. The rain and cold increased in intensity so no photos for the next 50km. I was still warm enough but considered finding a spot to pitch the tent and just get a stop to the rain. However, one thing that kept me going was far ahead I could see a patch of blue sky. While it was still wet and cold at least the road ahead looked better than behind. It took until 80km before the rain eased and then fairly quickly also stopped. The road was suddenly dry. Wow! It also warmed to 10C and then slowly a bit more. At 86km I reached a second summit, at 1004m the highest point between Fairbanks and Whitehorse. The next 14km past the summit was suddenly descent. No need to pedal, but instead watch to make sure I didn’t pick up too much speed. Somewhat amusing I found this sign around 96km warning of school buses and knew I was coming back to civilization. This community has around 100 residents, so not sure they have more than one or two school buses. At 100km the chip seal ended. Wow! Smooth asphalt, it had been a while and definitely made a difference. 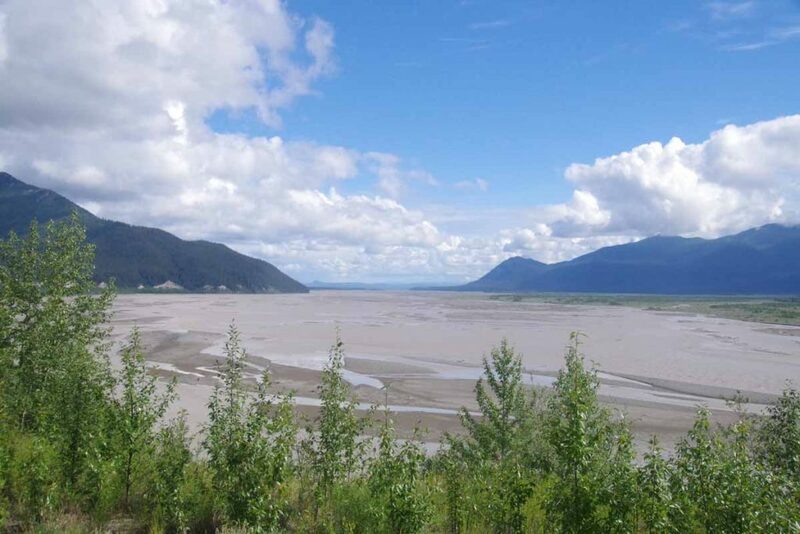 Rode the last several 6km to reach Haines Junction. Overall 60km of wet rain and two longer climbs made for a bit longer day, though a 14km descent at the end still made it not too tough. 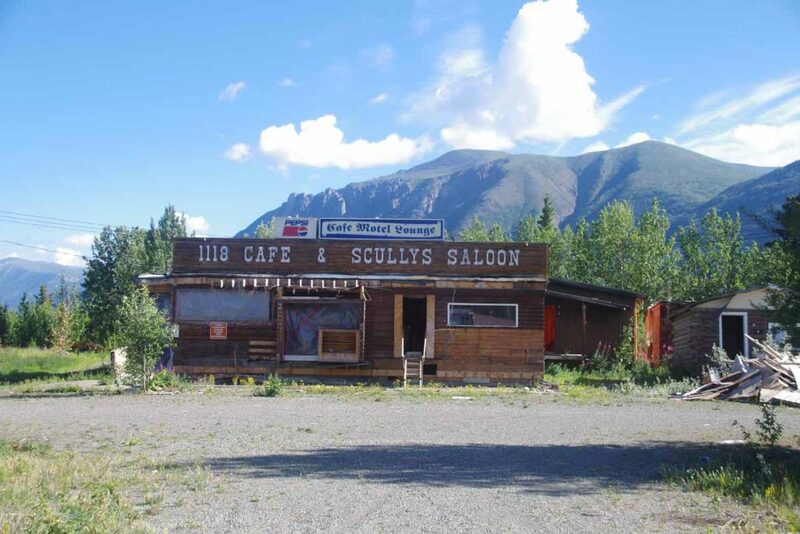 I then got a chance to wander around Haines Junction. On the main highway intersection is this statue. 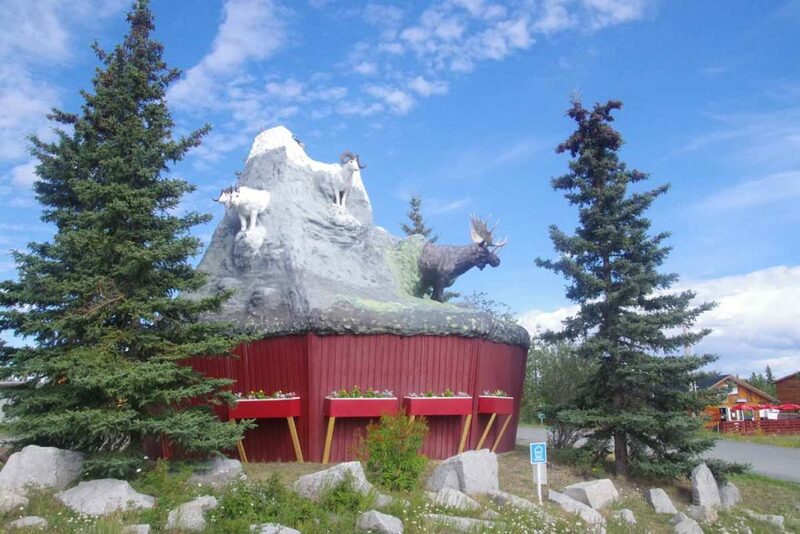 Locals call it “the muffin” since it looks like a large muffin with animals embedded. Interestingly enough on several back streets there are also blue signs directing people to “the muffin”. I found a nice bakery (opens at 7am!) and they also had a muffin sign but explained the inside joke to me. Here is sign explaining the church. 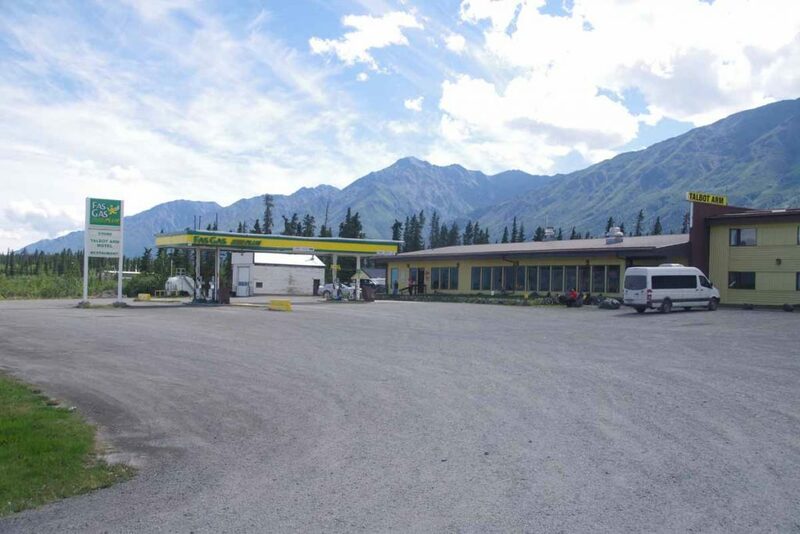 Here is overview photo showing the Haines Junction highway intersection but also the dramatic mountains found nearby. 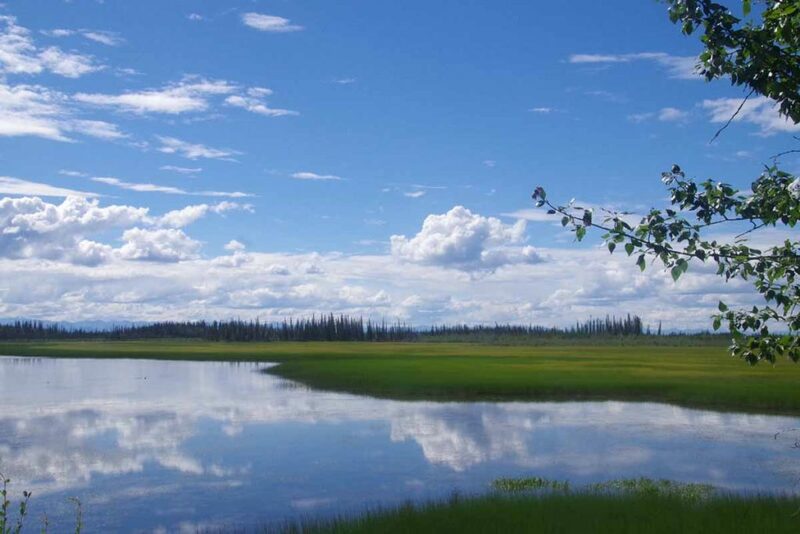 Two days cycling brought me to Kluane Lake. Looking at the maps, next point with motel and small grocery was Destruction Bay at 186km, a good two day cycle trip. I wasn’t quite as certain about the intermediate point but would figure it out. Photo above was taken several miles out. 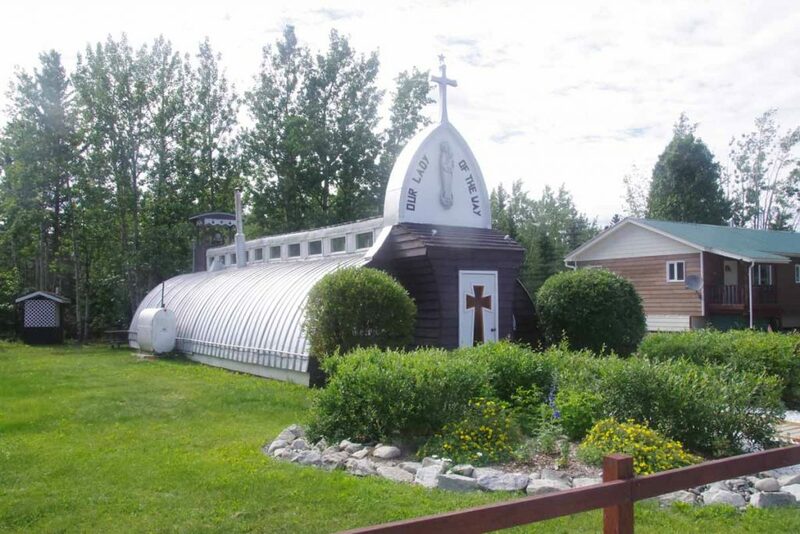 Apparently, the black pipes and white pipes are an experiment in handling permafrost. This was a fairly big issue for the first day route because the soils are a lot of loose sediment. If the road melts and then settles, it can sink away. Furthermore subsequent freezing causes the road surfaces to then bubble back up and become uneven. At least that was the explanation given on the rather bumpy rough chip seal as well as multiple areas of construction – some of which were also in construction in my 1997 trip. It was however again beautiful riding. At 30km I stopped briefly at a rest area overlook. I couldn’t see the highest mountains but still had some good views. It wasn’t flat, but also less hilly than the last two days. Not much later, a woman came by in truck, stopped and offered out a Gatorade. Thanks! She did have a question where us cyclists slept, so explained it. 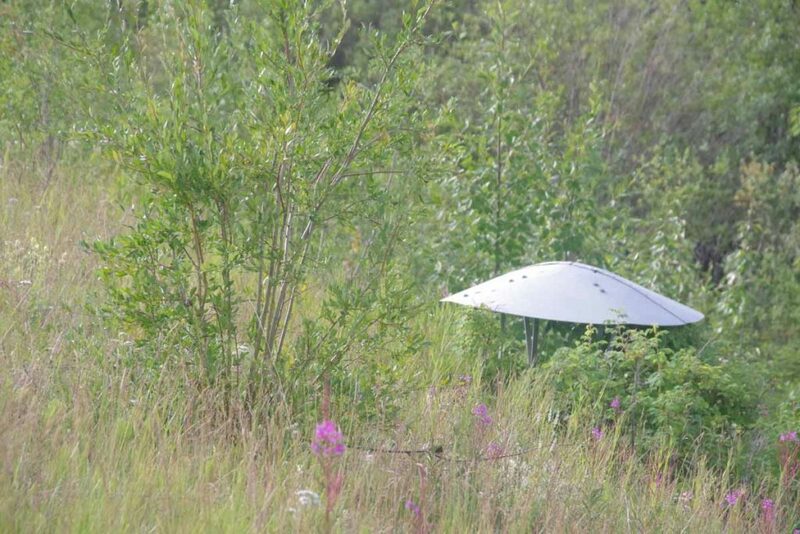 At 40km, there was a pickup parked that seemed associated with road crews. 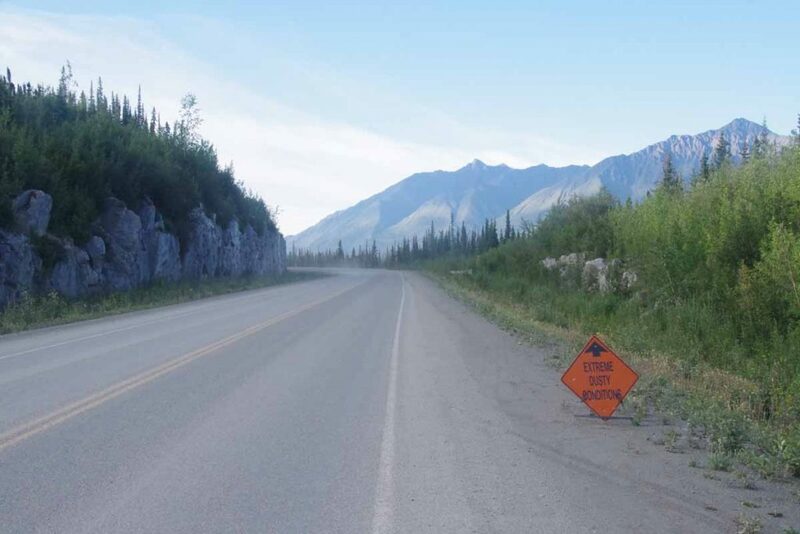 I asked about the road ahead and he also warned me that a bear had been sighted another 20km down the road. He had a photo. In the end I didn’t see that bear, but overall plan would have been to stick to the road and not do a lot of stopping. At 52km, I crossed the White River shown above. I was rather impressed by the huge flat silty path the river had placed for itself. 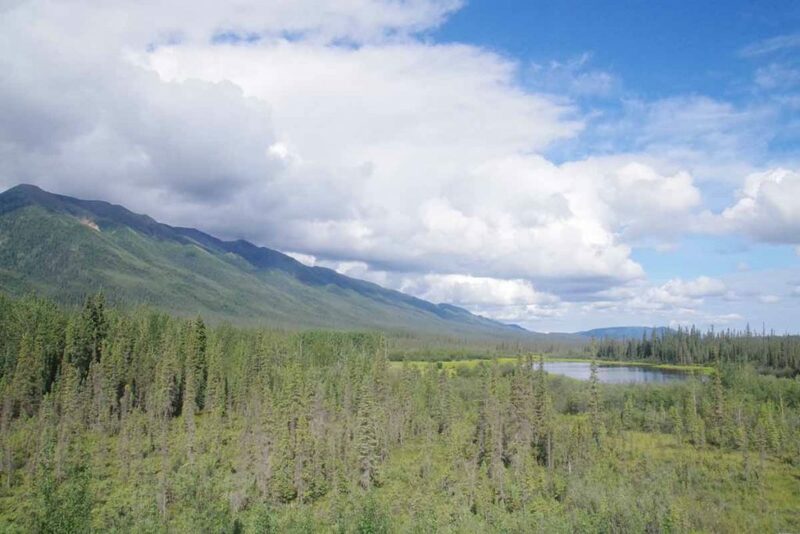 I had started following a region named the Shakwak Trench, a relatively flat valley sandwiched between the high Kluane Range and a smaller row of mountains. On the flats, rivers like the White River could really spread out their sediment. 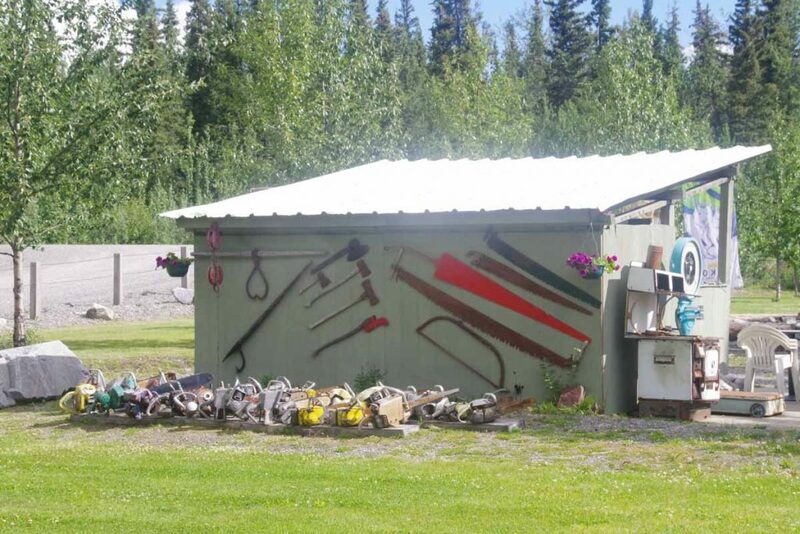 On other side of the White River was an RV park, with the saw collection including chainsaws shown above. Too soon to stop for the day, but good spot for an ice cream and refuel. 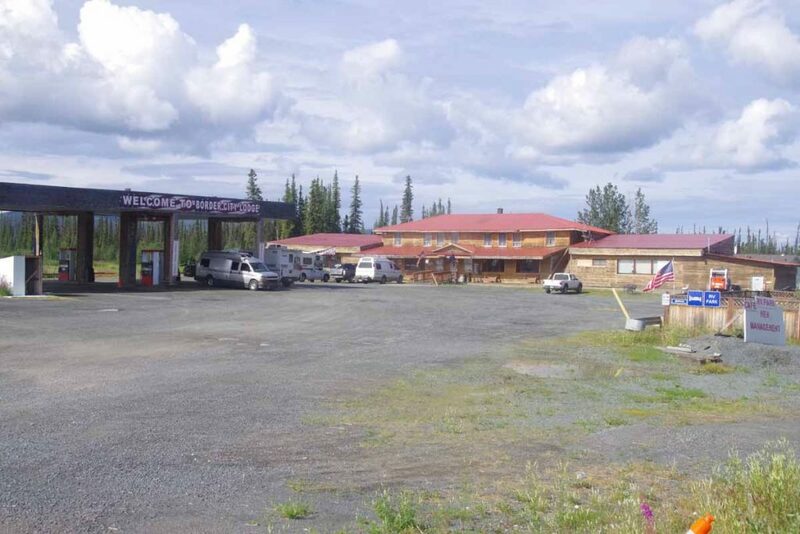 Another 8km brought me past the Koidern Lodge where I had stayed 19 years ago. Another of these old lodges that have fallen into disrepair. Picture above shows the “cockpit” that I’ve programmed my cycle computer to show various measures. Time, speed and distance and the most interesting ones but also nice to see the road grade (seems to measure slightly high) and temperature. What also was fun to see was the sunset time. As I have cycled further south the sunset adjusts – first day it started 10 minutes past midnight and now was only 2 minutes past midnight. Next photo was taken at local rest area where two fishermen were boating along. After this I passed a campground at 80km. 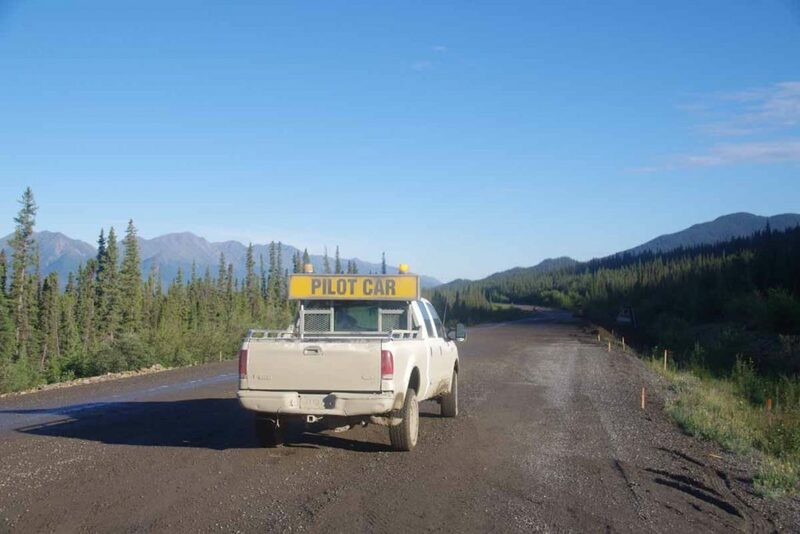 The guy that warned me about bears 25km back this time offered a ride in his pickup to Pine Valley, but I politely declined. a. Road construction starts very close after this. I’m told they use a pilot car and will want to take me in the pickup. b. 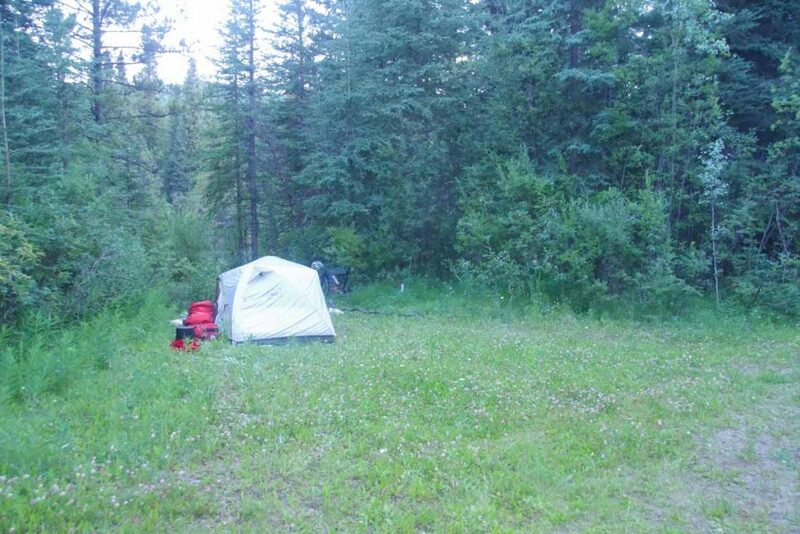 There were no formal campgrounds or places to stay and even not very many creek crossings listed. So I suspect I could find a spot, but still nice to have a guaranteed spot – particularly with some of the bear sightings in this area. So I rented a cabin and had some crepes as well as relaxing afternoon. 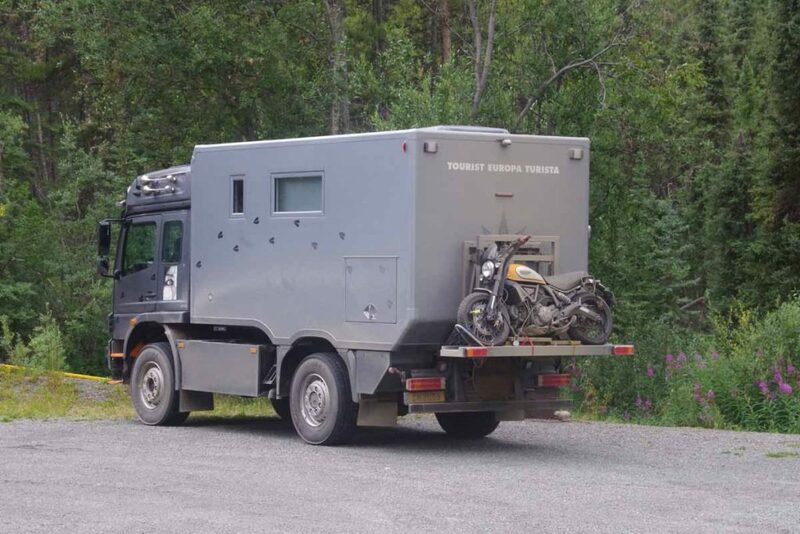 Only one small drawback was after I’d put the bike in the cabin, the owner came out and told me the bike had to be outside. So I unloaded my bags and locked the bike outside. I think he observed if there was any dirt it was actually on the panniers, not the bike – so not sure it was particularly effective for either of us – but still trying to follow the rules. 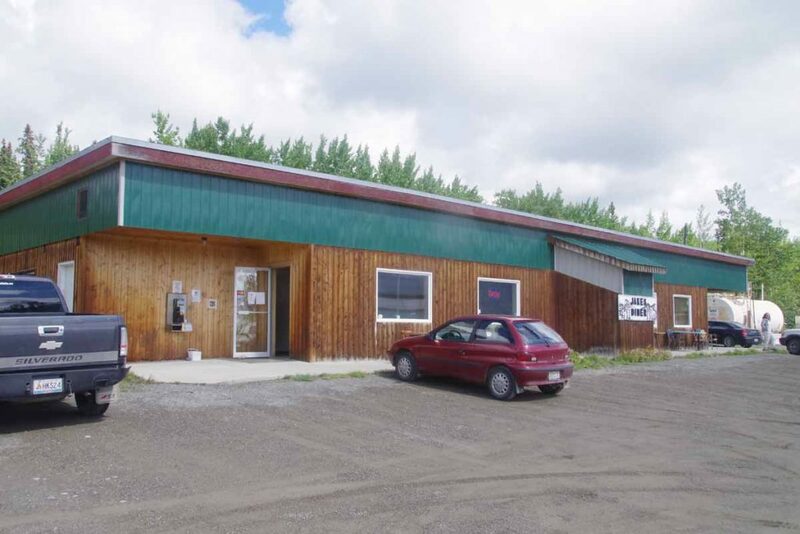 One interesting thing I noticed is this establishment was for sale (~$400k Canadian) as well as several other establishments I’ve come past. My own theory is there is a fairly high mortality rate for the mom and pop establishments. It definitely seems like a tough time to make most of your $$ in a short but very intense summer period between May and September. During that time places seemed to be open ~14 hours a day (7am to 9pm) and subject to whatever road traffic comes by. If it is just the “Mom” and “Pop”, then can be tough to get much relief and hence not quite as romantic idea as the “lets start a bakery on the Alaska Highway” notion. Second morning started with a nice cinnamon roll from the bakery and then tackle the road ahead. I expected some road construction fairly soon and saw the signs starting out. 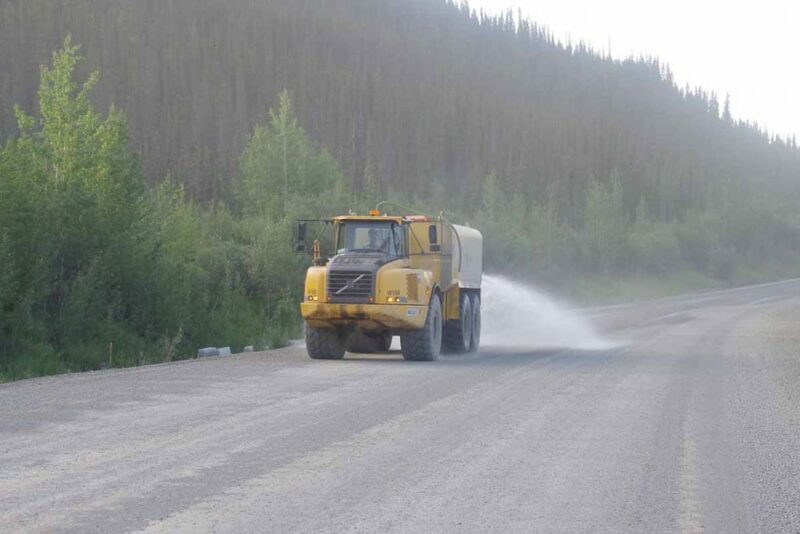 There were gravel patches again along with this water truck helping to keep the dust down. Fortunately, not enough water to really generate much mud. At 7km, I came to the real construction and they let me know I’d need to put the bike in back of the pilot car for a 10km segment. That all went fairly quickly and I got further intelligence about other cyclists on the road (three yesterday) as well as some past experiences with cyclists. Apparently, some are a bit more belligerent about going in the car. 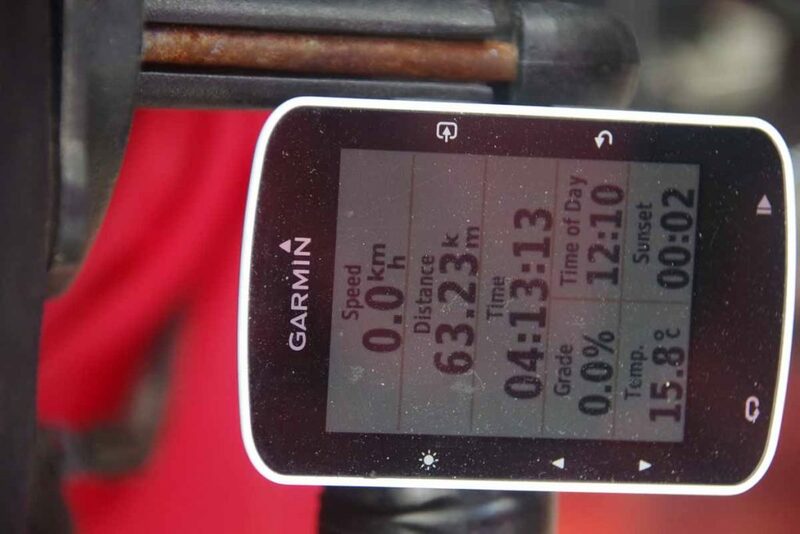 The pilot car let me off at 13km. I think they were accidentally 4km short, but there were several cars waiting to go the other direction. At 23km came to the wide and silty Donjek River. After this some more substantial climbs. Off in the distance one could see the St Elias mountains. Photo above of the mountains. 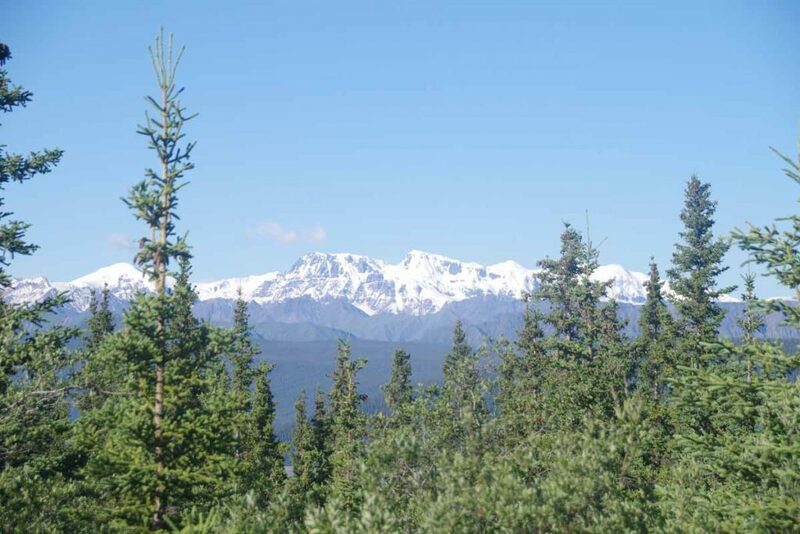 Local signs indicated Canada’s 16 highest peaks were all found in this area. As I crested top of the hill near 57km I stopped at a local rest area. One cinnamon roll hadn’t quite been enough so an early lunch. Two cyclists came up. Dave and Sarah from the UK were cycling from Anchorage to San Diego. We exchanged notes (they had camped at the Donjek) and they set off ahead while I finished eating. Unfortunately after this point and for rest of the day, the wind starting picking up and it was a headwind. So I was more nourished, but still was tougher cycling. The road had a few ups and downs but nothing too severe. At 83km was a Burwash Landing with a museum and not much else. Also here is the world’s largest gold pan. I went through the museum, partially to get some water but also to get a break from the wind. After that the last 16km brought me to Destruction Bay and good chance to rest and refuel. Saw Dave and Sarah here and they were going a little further to upcoming campground. I figured I’d tackle those miles tomorrow. 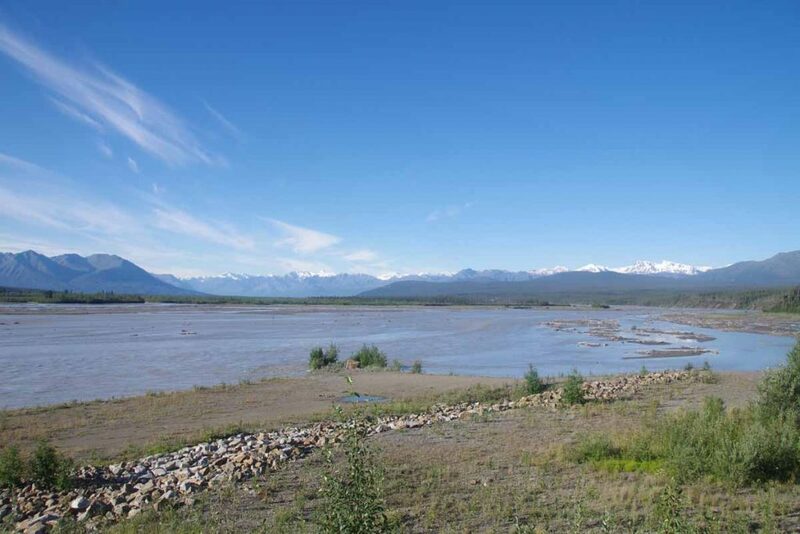 Nice to be here in Destruction Bay on shores of Kluane Lake. Definitely next to a very scenic and dramatic area of mountains.